R-79. Bushes vigorous. The clusters are medium (350 g), conical, of moderate density. The berries are large (4-5 g), oval, amber with a tan. Flesh is crisp, with a touch of nutmeg. Sugar content 16-17%, acidity 7-8 g / liter. Shoots ripen well. Grade productive. Ripens in early September. Resistant to mildew increased (3-3.5 points). Transportability is high. R-81. Bushes vigorous. The clusters are medium and large (300-400 g), cylindrical, conical and loose. 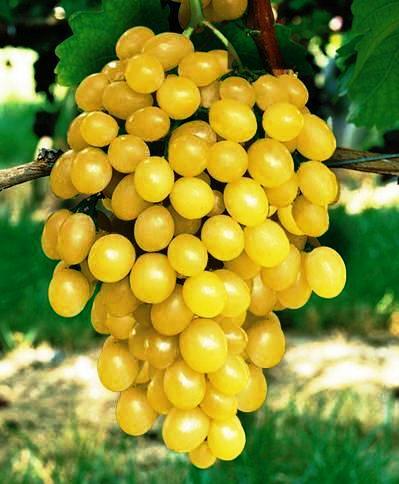 The berries are large (4-5 g), oval, amber-yellow, with muscat flavor. 18% sugar content, acidity 6-8 g / liter. Ripens in the third decade of August. Resistant to mildew increased (3.5 points). Transportability average. RF-48. 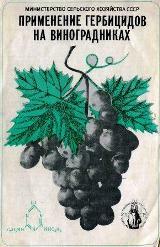 Hungarian variety. Shrubs of medium stature. The clusters are no large (180 g). The berries are medium and small (2.2 g), round, white. The flesh is juicy, simple taste. 21% sugar content, acidity 7-8 g / liter. Resistant to mildew, oidium, botrytis. Freezeproof to -24 ° C. Matures with Pearl Saba or earlier. Grade universal, that is used for fresh consumption and for making wine, juice. V-25/20. Synonym: Pleven. Bushes vigorous. The clusters are large (400-500 g), conical, medium density. Berries are large (27x20 mm, 6-7 g), oval, white, amber when fully ripe. The flesh is firm, a simple harmonious taste. Sugar content 19-21%, acidity 6-7 g / liter. high (14000 kg / ha). Shoots ripen well. Form resistant to fungal diseases, mildew, oidium, botrytis fruit, has a high resistance to spider mites and phylloxera. Indicators of merchantability and portability are very high. Matures at the end of the 2nd decade of August. V-95-22. Synonym: Muscat summer. Shrubs of medium stature. The clusters are medium density, weight 250 g, beautiful. The berries are large (5 g), oblong-oval shape with a sharp tip, greenish-yellow. Sugar content 18-19%, acidity 7-7.5 g / liter. Tasting score 8,1-8,3 points. Ripens at the same time with the Queen of vineyards. Yields of 13000-14000 kg / ha. Significant (2-2.5 points) resistance to fungal diseases: mildew, oidium, botrytis, rubella, anthracnose. Go to the root form of phylloxera is unstable. Frost resistance increased. Transportable medium, high marketability. V-42-82. Bulgarian variety. The bushes above the average of growth. The clusters are large (480 g), moderate density. The berries are large (5-6 g), round, dark red. Pulp fleshy juicy. Sugar content 16-17%, acidity 6-7 g / liter. Form productive. Shoots ripen satisfactorily. Resistant to mildew at 3.5 points. V-45/23. Synonym: Bulgaria steady. Medium-tall shrubs. The clusters are large (400-500 g), conical, of moderate density. The berries are large (5-6 g), oval, amber. Pulp fleshy-juicy, with a muscat aroma. 18.7% sugar content, acidity 5 g / liter. Resistant to mildew and botrytis increased (3-3.5 points). Marketability is high, the transportability of the mean. Matures at the end of the 2nd decade of August. The Augustowsky. Shrubs average of growth. 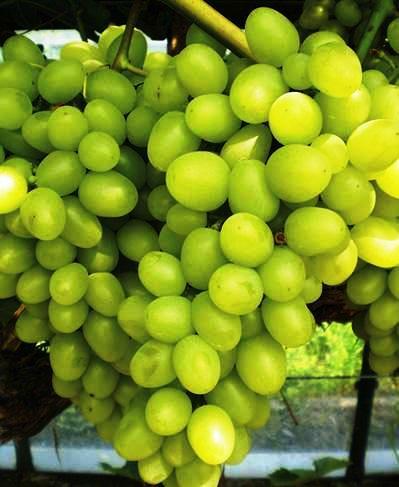 The clusters are medium density, weight of 200-220, the berries are medium (2 g), white, oval. Pulp fleshy-juicy, crisp, good taste. Sugar content 16-17%, pH 6-6.5 g / liter. Yields of 120-140 kg / ha. Matures with Pearl Saba or a little later. The duration of the period productional 108 days in the sum of active temperatures 2000 ° C. The variety has high resistance to mildew, botrytis, rubella, as well as field resistance to oidium, anthracnose. 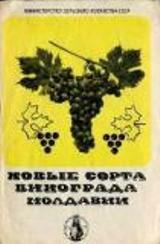 Tolerant to phylloxera (3 points). Frost resistance is high - at -25 ° C retained 80% of eyes. Transportability average. Agate Don. Bushes vigorous. The clusters are large (350-400 g), conical, medium density. The berries are large (4-5 g), round, black. 14% sugar content, acidity 6-7 g / liter. Has high resistance to frost (up to -26 ° C) and mildew (3.5)..
Aiwaz. The bushes grew. The clusters are medium-sized (200-300 g), conical, moderately dense. The berries are large (24 x 20 mm, 5-6 g), violet-black, oval, berry-like varieties of Moldova. The pulp is fleshy and taste simple and harmonious. Yield is high. Resistant to mildew and botrytis. Frost resistance of -23 .. .- 24 ° C. Maturation of the shoots is satisfactory. Ampel. Bushes vigorous. Bunches large, branched, loose. Berries large, round or teardrop, white. Pulp fleshy-juicy, harmonious taste. Yield is high. Resistant to mildew (3 points), oidium (2 points) and botrytis fruit. Frost resistance of -22 .. .- 23 ° C.
Arcadia. Synonym: Nastya. Shrubs of medium stature. The clusters are large (400-500 g), branched, conical, medium density, fine. The berries are large (6-7 g), egg-shaped, white. The pulp is fleshy and taste simple and harmonious. Grade productive. Resistance to mildew, 2-3 points, to gray mold of 3.5 points. By oidium unstable. Frost resistance increased (up to -24 ° C). Marketability and transportability are good. Ripens in first half of August. Asma Magaracha. Bushes are vigorous. Bunches large (300-500 g), conical, winged, medium density. Berries are quite large (3-4 g), oblong, slightly pointed, the skin is strong. The pulp is fleshy, juicy, simple taste. The sugar content of 16-18%, acidity 6-7 g/l Tasting score 8 points. The yield is high (200 kg/ha). Shoots ripen well. Resistance to mildew 2 points, to gray rot - 3 points. Defeat oidium and Anthracnose not observed. To phylloxera resistant (2 points). Variety is transportability and storability. Frost resistance increased (-23 °C). Aelita. The bush is medium size. Bunches medium (200 g), conical, moderate density. The berries are medium to large (3.5 g), oval, dark purple, with nutmeg aroma. The sugar content up to 22%, the acidity of 6-8 g/l Yield average. It has high resistance to mildew (3.5 points) and frost to -24.. .-25 °C. the Transportability good. 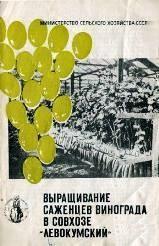 Belgrade seedless. 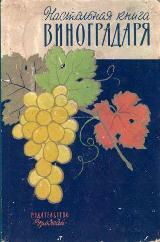 Yugoslavian variety. Shrubs of medium vigor. Bunches large (450 g), cylindrical-conical, medium density. Berries are large (21 x 16 mm, 3.5 g), oval, white. The flesh is thick, fleshy, very good taste. The sugar content of 18-20%, acidity 6.5 to 7 g/L. Variety of yield. Shoots ripen well. Transportability satisfactory. To disease unstable. 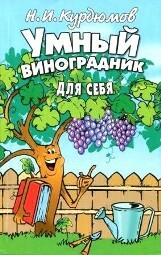 Belovezhski. The bush is medium size. Clusters of large, branched, not very dense. Berries large, slightly oval, amber-yellow. The pulp is fleshy, juicy, crisp, sweet taste. 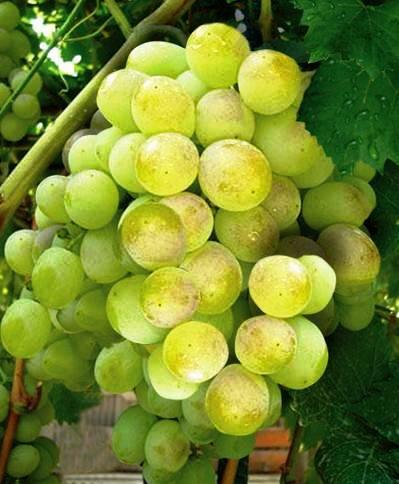 The high yield, resistant to oidium and Botrytis, has a high resistance to mildew. Frost -21.. .-22 °C. Biruinta. Moldovan grade. Bushes are vigorous. Clusters of large and very large: 700 g in average, up to a maximum of 2 kg or more. Berries very large: 35 x 22 mm, 18-20 g on average, and the largest reach 43 x 28 mm and weighs 28 grams, oval, green or white. The pulp is fleshy, juicy, simple pleasant taste. The yield is high (140 - 160 kg/ha), especially on large forming. Shoots ripen well. 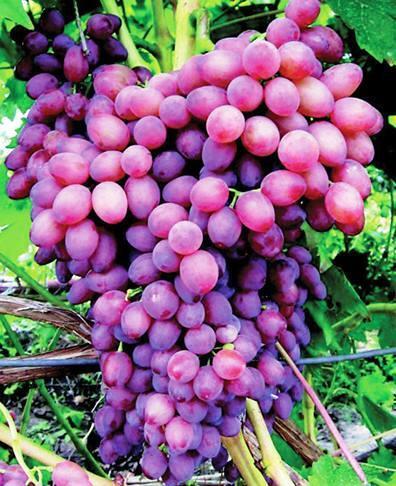 The variety is resistant to mildew, it has high resistance to spider mites and phylloxera. Resistant to oidium, berries can be affected by the moth, as the clusters are relatively dense. Drought-resistant. When excess moisture during ripening berries burst and marvel at grey mould. The average hardiness. Transportability weak, good marketability. Bornemisza Gergely 14. Hungarian variety. Shrubs of medium vigor. The bunches are large (400 g), conical, medium density or loose. Berries are large (5-6 g), oval, white, simple taste. The fleshy pulp is juicy. Aging shoots good. The yield is high. Varieties resistant to fungal diseases. Frost resistance increased (-23 °C). Bromery Know. Bushes are vigorous. Bunches large, conical, medium density. Berries are large (4-5 g), round, brick-red with a wax coating (pronom), creating the effect of frost. The pulp is fleshy, juicy, simple harmonic taste. Resistant to mildew, grey rot. Frost resistance increased (-23.. .-24 °C). Suitable for long term storage. Criuleni. Bushes are vigorous. Clusters of large or very large (500-1000 g), conical or branched, sredneplotnyh. Berries large and very large (6-8 g), rounded, purple-pink. The peel is thin, but very durable. The pulp is fleshy, juicy, pleasant taste, refreshing. The sugar content of 14-16%, acidity 8-10 g/l Tasting a score of 8.1-8.5 points. The yield is high (150-200 kg/ha), especially on large forming (200-250 q/ha). To avoid overloading, it is necessary during flowering to remove excess inflorescences. Shoots ripen well. The variety is resistant to mildew (2 points) and grey mould (2 points). 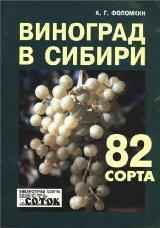 Grapes resistant to oidium (2 points). Resistance to Anthracnose and root phylloxera 3 points. Can withstand frost down to -27 °C. Grade transportable, has good keeping quality and can be kept long. Ripens in early October. Vierol-59. Bushes are vigorous. The bunches are large (400 g), conical, medium dense and dense, elegant. Berries are large (5 g), extra long, dark red to black. Skin tight. The flesh is crisp, the taste is simple. The sugar content of 16-17%, acidity 7.5 to 8 g/L. a Tasting of fresh grapes 8 points. The yield is high (140 kg/ha and more). Shoots ripen well. Resistance to mildew, oidium, Botrytis high (2 points), Anthracnose, phylloxera increased 3.2 points). Frost -25 °C. the Transportability high. The delight. Shrubs of medium vigor. Clusters of large (500 g), conical, medium density. Berries are large (5-6 g), round and slightly oval, white. The flesh is crisp, harmonious taste. Ripening usually 8-12 August. The yield is high. The variety has high resistance to cold (-25 °C) and mildew (3-3,5 points). Resistant to Botrytis berries. Marketability and high transportability. D-200. Comes from the crossing of one of the European varieties with Labrusca. The bushes are very slim. Bunches large (400-500 g), conical, medium density. Berries are large (6-8 g), extra long, black. The pulp is fleshy, juicy, simple, without isabellah tones of taste. The yield is high. Vine ripen very well. Resistant to mildew and oidium. Frost resistance increased. To phylloxera tolerance. Marketability and high transportability. Äà÷íûé. Êóñòû ðîñëûå. Ãðîçäè ñðåäíèå è êðóïíûå. ßãîäû ñðåäíèå è êðóïíûå, îâàëüíûå, ôèîëåòîâûå. Ìÿêîòü ìÿñèñòàÿ, âêóñ íåéòðàëüíûé, ãàðìîíè÷íûé. Óðîæàéíîñòü ñðåäíÿÿ. Óñòîé÷èâîñòü ê ìèëäüþ è ñåðîé ãíèëè î÷åíü âûñîêàÿ. Ìîðîçîñòîéêîñòü ïîâûøåííàÿ. Ïðèãîäåí äëÿ äëèòåëüíîãî õðàíåíèÿ. Äåêàáðüñêèé. Êóñòû ñèëüíîðîñëûå. Ãðîçäè ñðåäíåêðóïíûå (300 ã), öèëèíäðî-êîíè÷åñêèå, ñðåäíåé ïëîòíîñòè. ßãîäû ñðåäíèå è êðóïíûå (3—4 ã), ÿéöåâèäíûå, òåìíî-ôèîëåòîâûå ñ ïðóèíîì. Êîæèöà ïëîòíàÿ, õðóñòÿùàÿ. Ìÿêîòü ìÿñèñòî-ñî÷íàÿ, âêóñ ïðîñòîé, ãàðìîíè÷íûé. Ñàõàðèñòîñòü 16—18%, êèñëîòíîñòü 8—9 ã/ë. Äåãóñòàöèîííàÿ îöåíêà ñâåæåãî âèíîãðàäà 8,1—8,8 áàëëà. Óðîæàéíîñòü âûñîêàÿ (160—170 ö/ãà). Ïîáåãè âûçðåâàþò õîðîøî. Îòëè÷àåòñÿ âûñîêîé (2 áàëëà) óñòîé÷èâîñòüþ ê ìèëäüþ, îèäèóìó, ñåðîé ãíèëè, ïîâûøåííîé óñòîé÷èâîñòüþ (3 áàëëà) ê ôèëëîêñåðå è àíòðàêíîçó. Ìîðîçîñòîéêîñòü âûñîêàÿ (-25...-27 °Ñ). Òðàíñïîðòàáåëüíîñòü è ëåæêîñòü âûñîêèå. Äåðñó Óçàëà. Êóñòû ñðåäíåðîñëûå. Ãðîçäè êðóïíûå, êîíè÷åñêèå, âåòâèñòûå, ñðåäíåé ïëîòíîñòè. ßãîäû êðóïíûå, îâàëüíûå, áåëûå, ïðè õîðîøåì îñâåùåíèè ðîçîâàòî-ÿíòàðíûå. Ìÿêîòü ìÿñèñòî-ñî÷íàÿ, ïðèÿòíîãî âêóñà. Óðîæàéíîñòü âûñîêàÿ. Óñòîé÷èâîñòü ê ìèëäüþ è ñåðîé ãíèëè ïîâûøåííàÿ. Ìîðîçîñòîéêîñòü -21...-22 °Ñ. Ñîðò òðàíñïîðòàáåëüíûé, ïðèãîäåí äëÿ äëèòåëüíîãî õðàíåíèÿ. Äîëîðåñ. Êóñòû ñèëüíîðîñëûå. Ãðîçäè ñðåäíèå è êðóïíûå (300—400 ã), öèëèíäðî-êîíè÷åñêèå, ñðåäíåé ïëîòíîñòè. ßãîäû êðóïíûå (4—5 ã), îêðóãëûå èëè îâàëüíûå, ÷åðíûå. Ñàõàðèñòîñòü 18—22%, êèñëîòíîñòü 7—9 ã/ë. Óðîæàéíîñòü ñðåäíÿÿ. Ïîáåãè âûçðåâàþò õîðîøî. Ê ñåðîé ãíèëè íåâîñïðèèì÷èâ. ê ìèëäüþ è ìîðîçîñòîéêîñòü ïîâûøåííûå. Ïîðàæàåòñÿ îèäèóìîì. Òîâàðíîñòü, òðàíñïîðòàáåëüíîñòü è ëåæêîñòü õîðîøèå. Äîíñêîé áåëûé. Ñòîëîâûé ñîðò ñðåäíåïîçäíåãî ñðîêà ñîçðåâàíèÿ. Âåãåòàöèîííûé ïåðèîä 150—155 äíåé. Êóñòû ñèëüíîðîñëûå. Îäíîëåòíÿÿ ëîçà âûçðåâàåò õîðîøî. Ãðîçäè è ÿãîäû êðóïíûå, îâàëüíûå ñ çàîñòðåííûì êîí÷èêîì è øèïèêîì, çåëåíî-æåëòûå, ìÿêîòü õðóñòÿùàÿ, âêóñ ïðèÿòíûé. Ñîðò èìååò ôóíêöèîíàëüíî-æåíñêèé òèï öâåòêà. Ëó÷øèå ñîðòà-îïûëèòåëè: Ìóñêàò áåëûé, Ìóñêàò ãàìáóðãñêèé, Ñåíñî. Äðóæáà. Ñòîëîâî-òåõíè÷åñêèé ñîðò. Êóñòû ñðåäíåðîñëûå. Ãðîçäè öèëèíäðî-êîíè÷åñêèå ñ êðûëîì, ñðåäíåé ïëîòíîñòè, ìàññîé 300 ã. ßãîäû êðóïíûå (4 ã), îêðóãëûå, áåëûå. Ìÿêîòü ìÿñèñòî-ñî÷íàÿ, ñ ñèëüíûì ìóñêàòíûì àðîìàòîì, îòëè÷íîãî âêóñà. Ñàõàðèñòîñòü 19—21 %, êèñëîòíîñòü 6,5— 7,5 ã/ë. Ñîðò óðîæàéíûé. Óñòîé÷èâîñòü ê ìèëäüþ è ñåðîé ãíèëè 3 áàëëà. Ìîðîçîñòîéêîñòü äî -23 °Ñ. Ñóõîå âèíî èìååò ÿðêèé ìóñêàòíûé àðîìàò è ãàðìîíè÷íûé âêóñ. Åëåíà. Ñèíîíèì: Áî÷êà 5959/2. Êóñòû ñðåäíåé ñèëû ðîñòà. Ãðîçäè ñðåäíèå è êðóïíûå (300—400 ã), êîíè÷åñêèå, ñðåäíåé ïëîòíîñòè. ßãîäû êðóïíûå (28 õ 17 ìì, 6 ã), ÿéöåâèäíî-óäëèíåííûå ñ çàîñòðåííûì êîí÷èêîì, áåëûå. Ìÿêîòü ìÿñèñòî-ñî÷íàÿ, ñ ìóñêàòíûì àðîìàòîì, îòëè÷íîãî âêóñà. Ñîðò óðîæàéíûé. Ïîáåãè âûçðåâàþò õîðîøî. Óñòîé÷èâîñòü ê ìèëäüþ, îèäèóìó, ñåðîé ãíèëè íà óðîâíå 3 áàëëîâ. Ìîðîçîñòîéêîñòü äî -23 °Ñ. Æåì÷óã Ñàáà. Ñòîëîâûé ìóñêàòíûé ñîðò î÷åíü ðàííåãî ñðîêà ñîçðåâàíèÿ. Âûâåäåí â Âåíãðèè. Êà÷åñòâî âèíîãðàäà âûñîêîå, òðàíñïîðòàáåëüíîñòü íåäîñòàòî÷íàÿ. Ïðîäîëæèòåëüíîñòü ïåðèîäà îò ðàñïóñêàíèÿ ïî÷åê äî ïîëíîé çðåëîñòè ÿãîä 103—113 äíåé. Êóñò ñðåäíåðîñëûé, ÿãîäû ñðåäíåé âåëè÷èíû, æåëòîâàòî-çåëåíûå. Ëîçà âûçðåâàåò ïîëíîñòüþ. Óðîæàéíîñòü 60—80 ö/ãà. Ìîðîçîóñòîé÷èâîñòü ñëàáàÿ, òðåáóåò óêðûòèÿ íà çèìó Ðåêîìåíäóåòñÿ äëÿ âñåõ îáëàñòåé Óêðàèíû. Æåì÷óæèíà Ìîëäîâû. Êóñòû ñðåäíåðîñëûå. Ãðîçäè êðóïíûå (300—400 ã), êîíè÷åñêèå, ñðåäíåé ïëîòíîñòè èëè ðûõëûå. ßãîäû êðóïíûå (22 õ 20 ìì, 4—5 ã), îâàëüíûå, òåìíî-ñèíèå. Ìÿêîòü ìÿñèñòî-ñî÷íàÿ, ñ ìóñêàòíûì àðîìàòîì, î÷åíü õîðîøåãî âêóñà. Ôîðìà óðîæàéíàÿ, íî ïåðåãðóçîê íå ëþáèò. Óñòîé÷èâîñòü ê ìèëäüþ 3 áàëëà. Òîâàðíîñòü è òðàíñïîðòàáåëüíîñòü õîðîøèå. Çàãàäêà. Êóñòû ñèëüíîðîñëûå. Ãðîçäè ñðåäíèå (300 ã), ýôôåêòíûå. ßãîäû êðóïíûå (6—7 ã), îâàëüíûå, áåëûå. Ñîðò óðîæàéíûé. Óñòîé÷èâ ê ãðèáêîâûì çàáîëåâàíèÿì. Çàïîðîæñêèé ñóâåíèð. Êóñòû ñèëüíîðîñëûå. Ãðîçäè êðóïíûå (400—500 ã), êîíè÷åñêèå, ñðåäíåé ïëîòíîñòè. ßãîäû êðóïíûå è î÷åíü êðóïíûå (30—35 õ 20—24 ìì, 7—10 ã), ÿéöåâèäíûå, áåëûå ñ ðóìÿíöåì íà ñîëíå÷íîé ñòîðîíå. Ìÿêîòü ïëîòíàÿ, íåæíàÿ, ãàðìîíè÷íîãî âêóñà. Óðîæàéíîñòü âûñîêàÿ. Óñòîé÷èâ ê ìèëäüþ, ñåðîé ãíèëè, èìååò ïîâûøåííóþ óñòîé÷èâîñòü ê îèäèóìó (3,5 áàëëà). Ìîðîçîñòîéêîñòü ïîâûøåííàÿ. Òîâàðíîñòü è òðàíñïîðòàáåëüíîñòü õîðîøèå. Çâåçäíûé. Êóñòû ñèëüíîðîñëûå. Ãðîçäè êðóïíûå è î÷åíü êðóïíûå (600 ã), êîíè÷åñêèå, ñðåäíåé ïëîòíîñòè. ßãîäû êðóïíûå (5—6 ã), îêðóãëûå, áåëûå ñ çîëîòèñòî-áðîíçîâûì îòòåíêîì. Ìÿêîòü ïëîòíàÿ, õðóñòÿùàÿ, îòëè÷íîãî âêóñà, ñ ìóñêàòíûì àðîìàòîì. Óðîæàéíîñòü âûñîêàÿ. Ëîçà âûçðåâàåò õîðîøî. Óñòîé÷èâîñòü ê ìèëäüþ è ñåðîé ãíèëè âûñîêàÿ, ê îèäèóìó — ïîâûøåííàÿ (3,5 áàëëà). Òîâàðíîñòü è òðàíñïîðòàáåëüíîñòü âûñîêèå. Çîëîòèñòûé ðàííèé. Âåíãåðñêèé ñîðò î÷åíü ðàííåãî ñðîêà ñîçðåâàíèÿ. Âåãåòàöèîííûé ïåðèîä ÏÎ—112 äíåé. Ðîñò êóñòîâ ñëàáûé èëè ñðåäíèé. Ëîçà âûçðåâàåò íà 80—90%. Óðîæàéíîñòü 40—60 ö/ãà. ßãîäû ñðåäíèå, áåëûå, êîæèöà ïëîòíàÿ, ìÿêîòü ñî÷íàÿ, ñ íåæíûì ìóñêàòíûì àðîìàòîì. Èâëåï. Êóñòû ñèëüíîðîñëûå. Ãðîçäè êðóïíûå, øèðîêîêîíè÷åñêèå, âåòâèñòûå, ïîëóïëîòíûå. ßãîäû êðóïíûå, ñëàáîîâàëüíûå, áåëûå ñ çàãàðîì íà ñîëíå÷íîé ñòîðîíå. Ìÿêîòü ìÿñèñòî-ñî÷íàÿ, âêóñ ãàðìîíè÷íûé, ïðèÿòíûé. Óðîæàéíîñòü âûñîêàÿ. Óñòîé÷èâ ê ìèëäüþ, ñåðîé ãíèëè, âîñïðèèì÷èâ ê îèäèóìó. Ìîðîçîñòîéêîñòü -22...-23 °Ñ. Èìïóëüñ. Êóñòû ñèëüíîðîñëûå. Ãðîçäè êðóïíûå (550 ã), âåòâèñòûå, ðûõëûå. ßãîäû êðóïíûå (7 ã), îêðóãëûå èëè ïðèïëþñíóòûå, òåìíî-êðàñíûå. Óðîæàéíîñòü 140 ö/ãà. Óñòîé÷èâîñòü ê ìèëäüþ ïîâûøåííàÿ, ê ñåðîé ãíèëè è îèäèóìó — ñðåäíÿÿ. Èðèíêà. Êóñòû ñèëüíîðîñëûå. Ãðîçäè ñðåäíèå (200 ã). ßãîäû ñðåäíèå, îâàëüíî-óäëèíåííûå, áåëûå. Ìÿêîòü ìÿñèñòî-ñî÷íàÿ, ãàðìîíè÷íîãî âêóñà. Óðîæàéíîñòü âûñîêàÿ. Ñîðò óñòîé÷èâ ê ìèëäüþ è ñåðîé ãíèëè (2 áàëëà). Ìîðîçîñòîéêîñòü ïîâûøåííàÿ. Èòàëèÿ. Ñîðò ïîëó÷èë ðàñïðîñòðàíåíèå â Èòàëèè, Ôðàíöèè, Áîëãàðèè, ÑØÀ, ×èëè è äðóãèõ ñòðàíàõ. Êîðîíêà è ïåðâûé ëèñò ìîëîäîãî ïîáåãà áåëûå îò âîéëî÷íîãî îïóøåíèÿ ñ ðîçîâûìè ïÿòíàìè. Ïåðâûå ëèñòüÿ áåëîâàòî-çîëîòèñòûå, ïîñëåäóþùèå — ñâåòëî-çåëåíûå ñ çîëîòèñòûì îòòåíêîì. Îäíîëåòíèé âûçðåâøèé ïîáåã — êîðè÷íåâûé ñ áîëåå èíòåíñèâíî îêðàøåííûìè óçëàìè. Ëèñò î÷åíü êðóïíûé, 5-ëîïàñòíûé, ãëóáîêîðàññå÷åííûé, òåìíî-çåëåíûé, ãðóáûé, ñ âîëíèñòîé, ïóçûð÷àòîé èëè êðóïíîìîðùèíèñòîé ïîâåðõíîñòüþ. Öâåòîê îáîåïîëûé. Ãðîçäü êðóïíàÿ (äëèíîé 18—21, øèðèíîé 12—14 ñì), öèëèíäðî-êîíè÷åñêàÿ, ÷àñòî âåòâèñòàÿ, ñðàâíèòåëüíî ðûõëàÿ. Ñðåäíÿÿ ìàññà ãðîçäè 600 ã. ßãîäà î÷åíü êðóïíàÿ (äëèíîé 26—30, øèðèíîé 18—20 ìì), îâàëüíàÿ è ÿéöåâèäíàÿ, æåëòîâàòî-ÿíòàðíàÿ, ìàòîâàÿ, ïîêðûòà ãóñòûì ïðóèíîì. Êîæèöà ïðî÷íàÿ, òîëñòàÿ. Ìÿêîòü ìÿñèñòàÿ, âûñîêèõ âêóñîâûõ êà÷åñòâ, ñ îðèãèíàëüíûì ìóñêàòíî-öèòðîííûì àðîìàòîì. Ìàññà 100 ÿãîä â ïðîìûøëåííûõ íàñàæäåíèÿõ 545—630 ã. Â ÿãîäàõ ïî 2—4 êðóïíûõ ñåìåíè. Ñîðò ïîçäíåãî ñðîêà ñîçðåâàíèÿ: çðåëîñòü ÿãîä íàñòóïàåò â êîíöå ñåíòÿáðÿ. Êóñòû ñèëüíîðîñëûå. Îäíîëåòíèå ïîáåãè âûçðåâàþò äî 80 % äëèíû. Óðîæàéíîñòü ñîðòà âûñîêàÿ, íî íåïîñòîÿííàÿ. Ïëîäîíîñíûõ ïîáåãîâ 33—46%, ñðåäíåå êîëè÷åñòâî ñîöâåòèé íà ðàçâèâøåìñÿ ïîáåãå 0,2—0,5, íà ïëîäîíîñíîì 1,1—1,2. Ñîðò â ñðåäíåé ñòåïåíè ïîðàæàåòñÿ ìèëäüþ, ñåðîé ãíèëüþ ÿãîä è â ñèëüíîé ñòåïåíè — îèäèóìîì. Ìîðîçîóñòîé÷èâîñòü íèçêàÿ. Ïîáåãè èç çàìåùàþùèõ è ñïÿùèõ ïî÷åê îáðàçóþòñÿ ñëàáî. Êàíòåìèðîâñêèé. Êóñòû ñèëüíîðîñëûå. Ãðîçäè êðóïíûå (450 ã), êîíè÷åñêèå, ñðåäíåé ïëîòíîñòè èëè ðûõëûå. ßãîäû êðóïíûå (28 õ 23 ìì, 6—7 ã), ïðîäîëãîâàòûå, áåëûå. Ìÿêîòü ìÿñèñòàÿ, ïðîñòîãî âêóñà. Óðîæàéíîñòü 150 ö/ãà. Ïîáåãè âûçðåâàþò õîðîøî. Óñòîé÷èâîñòü ê ìèëäüþ âûñîêàÿ; ê îèäèóìó, ñåðîé ãíèëè, ôèëëîêñåðå — ïîâûøåííàÿ. Òðàíñïîðòàáåëüíîñòü ñðåäíÿÿ, òîâàðíîñòü âûñîêàÿ. Êàðàáóðíó. Âûñîêîóðîæàéíûé ñîðò ïîçäíåãî ñðîêà ñîçðåâàíèÿ. Âåãåòàöèîííûé ïåðèîä 155—160 äíåé. Ðîñò êóñòîâ âûøå ñðåäíåãî èëè ñèëüíûé. Ëîçà âûçðåâàåò íà 80—85 %. Ãðîçäè êðóïíûå, ÿãîäû áåëûå, îâàëüíûå, î÷åíü êðóïíûå. Ìÿêîòü ïëîòíàÿ, ÿãîäû îòëè÷àþòñÿ âûñîêîé òðàíñïîðòàáåëüíîñòüþ, õîðîøî õðàíÿòñÿ. Ìÿêîòü õðóñòÿùàÿ, ïðåêðàñíîãî âêóñà. Óðîæàéíîñòü 120—150 ö/ãà. Òðåáóåò äëèííîé îáðåçêè è íàäåæíîãî óêðûòèÿ íà çèìó. Êàðäèíàë. Ãðîçäü êðóïíàÿ (äëèíà 19—28 ñì, øèðèíà 13—19 ñì, ìàññà 342—510 ã), öèëèíäðî-êîíè÷åñêàÿ, ðûõëàÿ è î÷åíü ðûõëàÿ. ßãîäà î÷åíü êðóïíàÿ (äëèíà 21—29 ìì, øèðèíà 18—23 ìì), îêðóãëî-îâàëüíàÿ èëè îâàëüíàÿ, èíîãäà ñî ñêîøåííîé âåðøèíîé è íåáîëüøîé áîðîçäêîé íà íåé, ôèîëåòîâî-êðàñíàÿ, ñ äûì÷àòûì âîñêîâûì íàëåòîì. Ìàññà 100 ÿãîä 600—700 ã. Ìÿêîòü ìÿñèñòî-ñî÷íàÿ, õðóñòÿùàÿ, çåëåíîâàòî-áåëàÿ. Âêóñ âèíîãðàäà ïðèÿòíûé, ñî ñëàáî âûðàæåííûì ìóñêàòíûì àðîìàòîì. Îòíîñèòñÿ ê ñîðòàì âèíîãðàäà î÷åíü ðàííåãî ñðîêà ñîçðåâàíèÿ. Îò ðàñïóñêàíèÿ ãëàçêîâ äî ñúåìíîé çðåëîñòè ÿãîä â Ãåíè÷åñêå ïðîõîäèò 121 äåíü ïðè ñóììå àêòèâíûõ òåìïåðàòóð 2308 °Ñ. Ñîçðåâàíèå ÿãîä íàñòóïàåò â êîíöå ïåðâîé-âòîðîé äåêàäû àâãóñòà. Êóñòû ñðåäíåé ñèëû ðîñòà. Ïîáåãè âûçðåâàþò óäîâëåòâîðèòåëüíî. Íåóñòîé÷èâ ê îèäèóìó, ìèëäüþ, áàêòåðèàëüíîìó ðàêó, ñèëüíî âîñïðèèì÷èâ ê ñåðîé ãíèëè ÿãîä, ïîâðåæäàåòñÿ ãðîçäåâîé ëèñòîâåðòêîé. Êåøà-2. Óñòîé÷èâ ê ìèëäüþ, ñåðîé ãíèëè. Ìîðîçîñòîéêîñòü ïîâûøåííàÿ. Òèï öâåòêà ôóíêöèîíàëüíî-æåíñêèé. Óðîæàéíîñòü âûñîêàÿ. Îòëè÷àåòñÿ êðóïíûìè ÿãîäàìè, ìàêñèìàëüíàÿ ìàññà îòäåëüíûõ äîñòèãàåò 20 ã. Ñîçðåâàåò íåìíîãî ïîçæå Âîñòîðãà. Êèøèíåâñêèå çîðè. Êóñòû ñèëüíîðîñëûå. Ãðîçäè öèëèíäðî-êîíè÷åñêèå, ñðåäíåé ïëîòíîñòè èëè ðûõëûå, ìàññîé 300 ã. ßãîäû êðóïíûå (4—5 ã), îâàëüíî-îêðóãëûå, æåëòûå, ñ ìóñêàòíûì àðîìàòîì. Óðîæàéíîñòü 140 ö/ãà. Óñòîé÷èâîñòü ê âðåäèòåëÿì è áîëåçíÿì ïîâûøåííàÿ. Òðàíñïîðòàáåëüíîñòü è òîâàðíîñòü õîðîøèå. Êèøìèø ëó÷èñòûé. Êóñòû âûøå ñðåäíåé ñèëû ðîñòà. Ãðîçäè êðóïíûå (500 ã), êîíè÷åñêèå, âåòâèñòûå, ñðåäíåé ïëîòíîñòè. ßãîäû êðóïíûå (25 õ 18 ìì, 4—5 ã), óäëèíåííûå, ðîçîâûå, î÷åíü êðàñèâûå. Ìÿêîòü ïëîòíàÿ, ñ ëåãêèì ìóñêàòíûì àðîìàòîì, ãàðìîíè÷íîãî âêóñà. Íà äåãóñòàöèÿõ ñîðò îáû÷íî çàíèìàåò ïåðâûå ìåñòà. Óðîæàéíîñòü 130—150 ö/ãà. Ê áîëåçíÿì, êðîìå îèäèóìà, íåóñòîé÷èâ, íóæäàåòñÿ â õèìè÷åñêîé çàùèòå. Ãðîçäè è ÿãîäû îòëè÷àþòñÿ âûñîêîé òîâàðíîñòüþ. Òðàíñïîðòàáåëüíîñòü óäîâëåòâîðèòåëüíàÿ. Êèøìèø óíèêàëüíûé. Ìåæâèäîâîé ãèáðèä, óñòîé÷èâûé ê ìèëäüþ (3 áàëëà), ñåðîé ãíèëè (2 áàëëà), îèäèóìó (3,5 áàëëà), ìîðîçàì. Çèìóåò áåç óêðûòèÿ. Êóñòû ñðåäíåé èëè âûøå ñðåäíåé ñèëû ðîñòà. Ãðîçäè êðóïíûå è ñðåäíèå (300 ã), âåòâèñòûå, êîíè÷åñêèå, ñðåäíåé ïëîòíîñòè èëè ðûõëûå. ßãîäû ñðåäíèå, êðóãëûå, äèàìåòðîì 12—14 ìì, ÷åðíûå. Ìÿêîòü ìÿñèñòî-ñî÷íàÿ, õîðîøåãî âêóñà. Êîæèöà ïðî÷íàÿ. Ñàõàðèñòîñòü äî 24%, êèñëîòíîñòü 6—7 ã/ë. Î÷åíü óðîæàéíûé, òðàíñïîðòàáåëüíûé, ëåæêèé ñîðò. Ñîçðåâàåò â êîíöå àâãóñòà. Êèøìèø ÷åðíûé. Ñðåäíåàçèàòñêèé ñòîëîâûé áåññåìÿííûé ñîðò ðàííåãî ñðîêà ñîçðåâàíèÿ. Êóñòû ñèëüíîðîñëûå, ëîçà âûçðåâàåò õîðîøî. Ãðîçäè ñðåäíåãî ðàçìåðà, ÿãîäû îâàëüíûå, òåìíî-ñèíèå, ñðåäíåé âåëè÷èíû. Ìÿêîòü ìÿñèñòàÿ, ñî÷íàÿ, íåæíàÿ, îñâåæàþùåãî âêóñà. Óðîæàéíîñòü 55—80 ö/ãà. Õîðîøî ïëîäîíîñèò òîëüêî ïðè äëèííîé îáðåçêå, ôîðìèðîâêàõ ñ áîëüøèì çàïàñîì ìíîãîëåòíåé äðåâåñèíû. Êîáçàðü. Êóñòû ñèëüíîðîñëûå. Ãðîçäè êðóïíûå (400— 500 ã), âåòâèñòûå, ðûõëûå. ßãîäû êðóïíûå (6—8 ã), îâàëüíûå, áåëûå. Ìÿêîòü õðóñòÿùàÿ, î÷åíü õîðîøåãî âêóñà. Ïîáåãè âûçðåâàþò õîðîøî. Óðîæàéíîñòü 165 ö/ãà. Óñòîé÷èâîñòü ê ìèëäüþ è ìîðîçàì ïîâûøåííàÿ. Êîäðÿíêà. Êóñòû ñèëüíîðîñëûå. Ãðîçäè êðóïíûå (400— 800 ã), êîíè÷åñêèå, óìåðåííîé ïëîòíîñòè. ßãîäû êðóïíûå (30 õ 19 ìì, 6—8 ã), ÿéöåâèäíûå, òåìíî-ôèîëåòîâûå ñ ãóñòûì ïðóèíîì. Ìÿêîòü ìÿñèñòî-ñî÷íàÿ, ñ ïëîòíîé õðóñòÿùåé êîæèöåé. Ñàõàðèñòîñòü 15%, êèñëîòíîñòü 7 ã/ë. Óðîæàéíîñòü 140 ö/ãà. Õàðàêòåðíû ïîâûøåííàÿ óñòîé÷èâîñòü ê ìèëäüþ (3—3,5 áàëëà), ôèëëîêñåðå, ñåðîé ãíèëè è ñðåäíÿÿ óñòîé÷èâîñòü ê îèäèóìó. Âûñîêèå ïîêàçàòåëè òîâàðíîñòè, òðàíñïîðòàáåëüíîñòè è ëåæêîñòè. Óðîæàé ìîæåò äëèòåëüíîå âðåìÿ îñòàâàòüñÿ íà êóñòàõ. Âîçìîæíî òîðîøåíèå ÿãîä. Êîðèíêà ðóññêàÿ. Êóñòû ñèëüíîðîñëûå. Ãðîçäè ñðåäíèå, êîíè÷åñêèå, ÷àñòî êðûëàòûå, ðûõëûå. ßãîäû ìåëêèå (10— 12 ìì, 0,8 ã), îêðóãëûå, çîëîòèñòûå, ðîçîâåþùèå íà ñîëíå÷íîé ñòîðîíå. Ìÿêîòü ñî÷íàÿ, ïðèÿòíîãî âêóñà. Ñàõàðèñòîñòü 21 %, êèñëîòíîñòü 6 ã/ë. Óðîæàé ìîæåò äîëãî âèñåòü íà êóñòàõ. Ñîðò óðîæàéíûé, ïî÷òè íà êàæäîì ïîáåãå ïî 2—3 ãðîçäè. Óñòîé÷èâîñòü ê ìèëäüþ 2,5 áàëëà, ê ñåðîé ãíèëè 2 áàëëà. Çèìóåò áåç óêðûòèÿ. Êîðîëåâà âèíîãðàäíèêîâ. Âåíãåðñêèé ñòîëîâûé ñîðò ðàííåãî ñðîêà ñîçðåâàíèÿ. Âåãåòàöèîííûé ïåðèîä 125— 130 äíåé. Êóñòû äîñòàòî÷íî ñèëüíîðîñëûå, ëîçà âûçðåâàåò íà 80—90 %. Êèñòè áîëüøèå, ÿãîäû êðóïíûå, áåëûå, ìÿêîòü ñëåãêà ìÿñèñòàÿ, ñî÷íàÿ, ñ ëåãêèì ìóñêàòíûì àðîìàòîì. Êîñìîñ. Êóñòû ñðåäíåé èëè íèæå ñðåäíåé ñèëû ðîñòà. Ãðîçäè êðóïíûå (400 ã), êîíè÷åñêèå, ñðåäíåé ïëîòíîñòè. ßãîäû êðóïíûå (6 ã), îêðóãëî-îâàëüíûå, òåìíî-ñèíèå, ïðîñòîãî âêóñà. Óðîæàéíîñòü 120 ö/ãà. Ñîçðåâàåò â ïåðâîé äåêàäå àâãóñòà. Ñîðò óñòîé÷èâ ê ìèëäüþ, çèìîñòîéêîñòü ïîâûøåííàÿ. Òðàíñïîðòàáåëüíîñòü ñðåäíÿÿ, òîâàðíîñòü âûñîêàÿ. Êðàñàâèöà Öåãëåäà. Ñòîëîâûé âûñîêîêà÷åñòâåííûé ñîðò ðàííåãî ñðîêà ñîçðåâàíèÿ, âåãåòàöèîííûé ïåðèîä 130—135 äíåé. Ðîñò êóñòîâ ñðåäíèé. Ëîçà âûçðåâàåò õîðîøî. Öâåòêè îáîåïîëûå, êèñòè ñðåäíåé âåëè÷èíû, öèëèíäðè÷åñêèå èëè öèëèíäðî-êîíè÷åñêèå. ßãîäû êðóãëûå è ñðåäíèå, ñâåòëî-ðîçîâîé îêðàñêè, ìÿêîòü ñî÷íàÿ, ïðèÿòíàÿ íà âêóñ. Ñðåäíÿÿ óðîæàéíîñòü 50 ö/ãà. Óðîæàéíîñòü ïîâûøàåòñÿ íà ïëîäîðîäíûõ çåìëÿõ, õîðîøî îáåñïå÷åííûõ âëàãîé. Êðûæîâíèêîâûé. Êóñòû ñðåäíåé ñèëû ðîñòà. Ãðîçäè êðóïíûå, ñðåäíåïëîòíûå è ðûõëûå. ßãîäû êðóïíûå, îêðóãëûå, áëåäíî-ðîçîâûå, ïðîñòîãî ãàðìîíè÷íîãî âêóñà. Ïîáåãè õîðîøî âûçðåâàþò. Óðîæàéíîñòü ñðåäíÿÿ. Óñòîé÷èâîñòü ê ìèëäüþ, îèäèóìó è ñåðîé ãíèëè âûñîêàÿ (2 áàëëà). Ìîðîçîñòîéêîñòü ïîâûøåííàÿ. Êóòóçîâñêèé. Êóñòû ñèëüíîðîñëûå. Ãðîçäè ñðåäíèå (300 ã), öèëèíäðî-êîíè÷åñêèå, ñðåäíåé ïëîòíîñòè è ðûõëûå. ßãîäû êðóïíûå (5—6 ã), òåìíî-ôèîëåòîâûå ñ ïðóèíîì. Êîæèöà ïëîòíàÿ, ïðî÷íàÿ. Ìÿêîòü ìÿñèñòî-ñî÷íàÿ, âêóñ ïðîñòîé. Ñàõàðèñòîñòü 18—20%, êèñëîòíîñòü 7—8 ã/ë. Äåãóñòàöèîííàÿ îöåíêà 8,5 áàëëà. Óðîæàéíîñòü 145 ö/ãà. Ïîáåãè âûçðåâàþò õîðîøî. Ñîðò îòëè÷àåòñÿ õîðîøåé òðàíñïîðòàáåëüíîñòüþ è ëåæêîñòüþ (äî 150 äíåé), îáëàäàåò âûñîêîé óñòîé÷èâîñòüþ ê ìèëäüþ (2 áàëëà) è ñåðîé ãíèëè (1 áàëë). Ê àíòðàêíîçó è ôèëëîêñåðå óñòîé÷èâîñòü 3 áàëëà. Ëàíêà. Êóñòû ñðåäíåðîñëûå. Ãðîçäè êðóïíûå (450 ã), êîíè÷åñêèå, ðûõëûå è ñðåäíåé ïëîòíîñòè. ßãîäû êðóïíûå (5 ã), ÿéöåâèäíûå ñ çàîñòðåííûì êîíöîì, áåëûå ñ ãóñòûì ïðóèíîì. Êîæèöà ïðî÷íàÿ. Ìÿêîòü ìÿñèñòî-ñî÷íàÿ, âêóñ ïðîñòîé. Ñàõàðèñòîñòü 14—15%, êèñëîòíîñòü 5—6 ã/ë. Óðîæàéíîñòü âûñîêàÿ (174 ö/ãà). Ïîáåãè âûçðåâàþò õîðîøî. Óñòîé÷èâîñòü ê ìèëäüþ, îèäèóìó 3 áàëëà, ê ñåðîé ãíèëè 3,5 áàëëà. Ìîðîçîóñòîé÷èâîñòü äî -24 °Ñ. Ïðèãîäåí äëÿ äëèòåëüíîãî õðàíåíèÿ. Òðàíñïîðòàáåëüíîñòü âûñîêàÿ. Ëèäèàíà. Êóñòû ñèëüíîðîñëûå. Ãðîçäè êðóïíûå (400— 500 ã), öèëèíäðî-êîíè÷åñêèå, ðûõëûå. ßãîäû êðóïíûå (5— 6 ã), îâàëüíûå, áåëûå. Ìÿêîòü ìÿñèñòî-ñî÷íàÿ, ïðîñòîãî âêóñà. Ñîðò óðîæàéíûé. Ïîáåãè âûçðåâàþò õîðîøî. Íå áîèòñÿ ìèëäüþ, ñåðîé ãíèëè, àíòðàêíîçà. Èìååò ïîâûøåííóþ óñòîé÷èâîñòü ê îèäèóìó, ôèëëîêñåðå, ìîðîçó (äî -24 °Ñ). Ëÿíà. Êóñòû ñðåäíåé èëè âûøå ñðåäíåé ñèëû ðîñòà. Ãðîçäè ñðåäíèå (200—250 ã), êîíè÷åñêèå, ñðåäíåé ïëîòíîñòè. ßãîäû ñðåäíèå è êðóïíûå (4—5 ã), ÿéöåâèäíûå, áåëûå. Ìÿêîòü ìÿñèñòî-ñî÷íàÿ, âêóñ ïðîñòîé. Ñàõàðèñòîñòü 16—18%, êèñëîòíîñòü 6—7 ã/ë. Óðîæàéíîñòü âûñîêàÿ. Ñîðò óñòîé÷èâ ê ìèëäüþ, îèäèóìó, ñåðîé ãíèëè, ôèëëîêñåðå (2—3 áàëëà). Ìîðîçîñòîéêîñòü ïîâûøåííàÿ. Òðàíñïîðòàáåëüíîñòü âûñîêàÿ. Ëîçà Âàâèëîâà. Êóñòû ñèëüíîðîñëûå. Ãðîçäè êðóïíûå, êîíè÷åñêèå, âåòâèñòûå, ñðåäíåïëîòíûå. ßãîäû êðóïíûå (28 õ 20 ìì), îâàëüíûå, òåìíî-ðîçîâûå. Ìÿêîòü ìÿñèñòàÿ, íåæíàÿ. Óðîæàéíîñòü âûñîêàÿ. Ñîðò óñòîé÷èâ ê ãðèáêîâûì áîëåçíÿì. Ëîçà Ãàãàðèíà. Êóñòû ñðåäíåé ñèëû ðîñòà. Ãðîçäè î÷åíü êðóïíûå, âåòâèñòûå, ðûõëûå. ßãîäû êðóïíûå, ïðîäîëãîâàòûå, ÿíòàðíî-ðîçîâûå. Ìÿêîòü ìÿñèñòàÿ, ïëîòíàÿ, ïðèÿòíîãî âêóñà. Óðîæàéíîñòü âûñîêàÿ, òðåáóåòñÿ íîðìèðîâàíèå óðîæàÿ. Óñòîé÷èâ ê ìèëäüþ (2,5 áàëëà) è ñåðîé ãíèëè. Ìîðîçîñòîéêîñòü -21.. .-22 °Ñ. Òðàíñïîðòàáåëüíîñòü è ëåæêîñòü âûñîêèå. Ëîçà ìèðà. Êóñòû ñðåäíåðîñëûå. Ãðîçäè êðóïíûå, êîíè÷åñêèå, ñðåäíåé ïëîòíîñòè. ßãîäû êðóïíûå, îêðóãëûå, áåëûå. Ìÿêîòü ìÿñèñòî-ñî÷íàÿ, ïðèÿòíîãî âêóñà. Êîæèöà ïðî÷íàÿ. Ñåìåíà ìåëêèå, 1—2 øò. Óðîæàéíîñòü âûñîêàÿ. Óñòîé÷èâ ê îèäèóìó, ñåðîé ãíèëè è ïîâûøåííî óñòîé÷èâ ê ìèëäüþ. Ìîðîçîñòîéêîñòü -21... -22 °Ñ. Òðàíñïîðòàáåëüíîñòü è ëåæêîñòü õîðîøèå. Òîâàðíîñòü âûñîêàÿ. Ëóííûé. Êóñòû ñèëüíîðîñëûå. Ãðîçäè êðóïíûå (450 ã), öèëèíäðè÷åñêèå, ñðåäíåé ïëîòíîñòè èëè ðûõëûå. ßãîäû êðóïíûå (5—6 ã), îêðóãëûå, áëåäíî-ðîçîâûå. Âêóñ ïðîñòîé, ãàðìîíè÷íûé. Óðîæàéíîñòü âûñîêàÿ (150—180 ö/ãà). Óñòîé÷èâîñòü ê ìèëäüþ ïîâûøåííàÿ. Ñðåäíåóñòîé÷èâ ê ñåðîé ãíèëè, îèäèóìó. Èìååò õîðîøèå ïîêàçàòåëè òîâàðíîñòè è ñðåäíèå — òðàíñïîðòàáåëüíîñòè. Ìàäëåí Àíæåâèí. Ôðàíöóçñêèé ñîðò î÷åíü ðàííåãî ñðîêà ñîçðåâàíèÿ. Êà÷åñòâî ÿãîä õîðîøåå, âåëè÷èíà ñðåäíÿÿ, öâåò çåëåíîâàòî-áåëûé, âêóñ ïðîñòîé, áåç àðîìàòà. Òðàíñïîðòàáåëüíîñòü íèçêàÿ, ðîñò êóñòîâ ñðåäíèé. Ëîçà âûçðåâàåò õîðîøî. Âåãåòàöèîííûé ïåðèîä 130—140 äíåé. Óðîæàéíîñòü 5—8 òîíí ñ ãåêòàðà. Ñîðò èìååò ôóíêöèîíàëüíî-æåíñêèé òèï öâåòêà, ïîýòîìó òðåáóåò äîïîëíèòåëüíîãî îïûëåíèÿ. Ëó÷øèå îïûëèòåëè: Øàñëà áåëàÿ, Ïîðòóãèçåð, Ìóñêàò ãàìáóðãñêèé. Ðàéîíèðîâàí â Äíåïðîïåòðîâñêîé îáëàñòè. Ìàðèíêà. Êóñòû ñðåäíåðîñëûå. Ãðîçäè êðóïíûå (450 ã), ðûõëûå èëè ñðåäíåïëîòíûå. ßãîäû êðóïíûå (5 ã), îêðóãëûå èëè îâàëüíûå, áåëûå ñ ðîçîâûì çàãàðîì. Ìÿêîòü ìÿñèñòî-ñî÷íàÿ, ñ ïðèÿòíûì ìóñêàòíûì àðîìàòîì. Äåãóñòàöèîííàÿ îöåíêà 8,6 áàëëà. Óðîæàéíîñòü âûñîêàÿ (140—160 ö/ãà). Óñòîé÷èâîñòü ê ìèëäüþ 3 áàëëà, ê ñåðîé ãíèëè — 3,5 áàëëà, ê ôèëëîêñåðå — 3 áàëëà. Èìååò âûñîêèå ïîêàçàòåëè òîâàðíîñòè è òðàíñïîðòàáåëüíîñòè. Ìàòÿø ßíîø. Ñòîëîâûé ìóñêàòíûé ñîðò ðàííåãî ñðîêà ñîçðåâàíèÿ. Âåãåòàöèîííûé ïåðèîä 140 äíåé. Ðîñò êóñòîâ ñðåäíèé, âûçðåâàåò ëîçà õîðîøî. Öâåòêè îáîåïîëûå, ãðîçäè äëèííûå, ÷àñòî êðûëàòûå. ßãîäû ñðåäíèå, êðóãëûå, ÿðêî-êðàñíûå. Ìÿêîòü äîâîëüíî ïëîòíàÿ, ïî÷òè õðóñòÿùàÿ, ñ ñèëüíûì ìóñêàòíûì àðîìàòîì. Ñàõàð ïðåîáëàäàåò íàä . Ñîðò îñîáåííî öåíåí òåì, ÷òî çàïàñíûå ïî÷êè ÿâëÿþòñÿ ïëîäîíîñÿùèìè è ïðè ãèáåëè öåíòðàëüíîé óðî¬æàéíîñòü êóñòîâ ïðàêòè÷åñêè íå ñíèæàåòñÿ. Ìåðæàíèàíè. Êóñòû ñèëüíîðîñëûå. Ãðîçäè î÷åíü êðóïíûå (700 ã), øèðîêîêîíè÷åñêèå èëè âåòâèñòûå, ñðåäíåé ïëîòíîñòè. ßãîäû î÷åíü êðóïíûå (7—8 ã, íàèáîëåå êðóïíûå 12 ã è áîëåå), ÿéöåâèäíûå, êðàñíî-ôèîëåòîâûå. Ìÿêîòü ìÿñèñòî-ñî÷íàÿ, âêóñ ïðîñòîé. Ñàõàðèñòîñòü 16—17%, êèñëîòíîñòü 7—8 ã/ë. Ëîçà âûçðåâàåò õîðîøî. Óñòîé÷èâîñòü ê ìèëäüþ âûñîêàÿ, ê îèäèóìó è ñåðîé ãíèëè — ïîâûøåííàÿ. Èìååò õîðîøèå ïîêàçàòåëè òîâàðíîñòè è òðàíñïîðòàáåëüíîñòè. Ñîçðåâàåò â êîíöå ñåíòÿáðÿ. Ìèíæèðñêèé. Ïîëó÷åí ñêðåùèâàíèåì: ×àóø ÷åðíûé õ ÑÁ 20-366. Êóñòû ñðåäíåðîñëûå. Ãðîçäè êðóïíûå (700 ã), íàðÿäíûå, ïëîòíûå èëè ñðåäíåïëîòíûå. ßãîäû îêðóãëûå è îâàëüíûå, òåìíî-ôèîëåòîâûå, êðóïíûå (4—5 ã). Ìÿêîòü ìÿñèñòî-ñî÷íàÿ íåéòðàëüíîãî âêóñà. Ñîðò î÷åíü óðîæàéíûé, ñêëîíåí ê ïåðåãðóçêå óðîæàåì. Òðåáóåò íîðìèðîâàíèÿ óðîæàÿ. Óñòîé÷èâîñòü ê ìèëäüþ, îèäèóìó è ñåðîé ãíèëè — 2 áàëëà. Ïîáåãè âûçðåâàþò î÷åíü õîðîøî. Ìîðîçîñòîéêîñòü î÷åíü ïîâûøåííàÿ. Èñïûòûâàåòñÿ â íåóêðûâíîé êóëüòóðå â ìåñòíûõ óñëîâèÿõ. Ìîëäîâà. Êóñòû ñèëüíîðîñëûå. Ãðîçäè ñðåäíèå è êðóïíûå (400 ã), öèëèíäðî-êîíè÷åñêèå è êîíè÷åñêèå, ñðåäíåé ïëîòíîñòè. ßãîäû êðóïíûå (25 õ 19 ìì, 5—6 ã), îâàëüíûå, òåìíî-ôèîëåòîâûå ñ ïðóèíîì. Êîæèöà ïëîòíàÿ, ïðî÷íàÿ. Ìÿêîòü ìÿñèñòàÿ, õðóñòÿùàÿ, âêóñ ïðîñòîé. Ñàõàðèñòîñòü 17—18%, êèñëîòíîñòü 7—10 ã/ë. Äåãóñòàöèîííàÿ îöåíêà 8 áàëëîâ. Óðîæàéíîñòü âûñîêàÿ, 150—200 ö/ãà. Ïîáåãè âûçðåâàþò õîðîøî. Ê ñåðîé ãíèëè, ìèëäüþ óñòîé÷èâîñòü 2 áàëëà, ê ôèëëîêñåðå óñòîé÷èâîñòü ïîâûøåííàÿ — 3,3 áàëëà. Çèìîñòîéêîñòü ïîâûøåííàÿ. Ñîðò îòëè÷àåòñÿ âûñîêîé òðàíñïîðòàáåëüíîñòüþ, îòëè÷íîé ëåæêîñòüþ ïðè õðàíåíèè (180 äíåé), êðàñèâûì âíåøíèì âèäîì. Ïðîäîëæèòåëüíîñòü ïåðèîäà îò ðàñïóñêàíèÿ ïî÷åê äî ñîçðåâàíèÿ ÿãîä (ïðîäóêöèîííûé ïåðèîä) 165— 170 äíåé ïðè ñóììå àêòèâíûõ òåìïåðàòóð 3000—3100 °Ñ. Ñîçðåâàåò â êîíöå ñåíòÿáðÿ — íà÷àëå îêòÿáðÿ. Ìóðîìåö. Êóñòû ñèëüíîðîñëûå. Ãðîçäè êðóïíûå (400 ã), êîíè÷åñêèå, ñðåäíåé ïëîòíîñòè. ßãîäû êðóïíûå (5 ã), òåìíî-ôèîëåòîâûå ñ ãóñòûì ïðóèíîì. Ìÿêîòü ìÿñèñòàÿ, õðóñòÿùàÿ, áåç àðîìàòà. Ñàõàðèñòîñòü 17%, êèñëîòíîñòü 5—7 ã/ë. Îòëè÷àåòñÿ ïîâûøåííîé óñòîé÷èâîñòüþ ê ìîðîçàì (äî -26 °Ñ). Óñòîé÷èâîñòü ê ìèëäüþ è ñåðîé ãíèëè 3 áàëëà. Âîñïðèèì÷èâ ê îèäèóìó è ôèëëîêñåðå. Óðîæàéíîñòü âûñîêàÿ. Ìóñêàò âåíãåðñêèé. Ñòîëîâûé è òåõíè÷åñêèé ñîðò ðàííåãî ñðîêà ñîçðåâàíèÿ. Âåãåòàöèîííûé ïåðèîä 125—130 äíåé. Ðîñò êóñòîâ ñðåäíèé, âûçðåâàíèå ëîçû õîðîøåå, óðîæàéíîñòü âûñîêàÿ (70—100 ö/ãà). Êèñòè ñðåäíèå è êðóïíûå, ÿãîäà ñðåäíåé âåëè÷èíû, áåëàÿ, ñîê îñâåæàþùèé, ñ ìóñêàòíûì àðîìàòîì. Íåäîñòàòîê ñîðòà — ðàñòðåñêèâàíèå ÿãîä â äîæäëèâóþ ïîãîäó. Ìóñêàò ãàìáóðãñêèé. Öåííûé ñòîëîâûé ñîðò ñðåäíåãî ñðîêà ñîçðåâàíèÿ. Âåãåòàöèîííûé ïåðèîä 145—150 äíåé. Êóñòû ñðåäíåðîñëûå, ëîçà âûçðåâàåò õîðîøî. Ãðîçäè ñðåäíåé âåëè÷èíû, ÿãîäû êðóïíûå, òåìíî-ñèíèå, ìÿêîòü ñî÷íàÿ, ìÿñèñòàÿ, ñ õîðîøî âûðàæåííûì ìóñêàòíûì àðîìàòîì, ïðåâîñõîäíîãî âêóñà. Óðîæàéíîñòü 60—80 ö/ãà, õîðîøî îòçûâàåòñÿ íà ïðèùèïûâàíèå ïîáåãîâ ïåðåä öâåòåíèåì è äîïîëíèòåëüíîå îïûëåíèå. Ìóñêàò äåðáåíòñêèé. Êóñòû ñèëüíîðîñëûå. Ãðîçäè êðóïíûå, âåòâèñòûå, ðûõëûå. ßãîäû êðóïíûå, ñëàáî-îâàëüíûå, çåëåíîâàòî-æåëòûå, íà ñîëíå÷íîé ñòîðîíå ðîçîâàòî-æåëòûå. Êîæèöà òîëñòàÿ. Ìÿêîòü ìÿñèñòî-ñî÷íàÿ, ñ ñèëüíî âûðàæåííûì ìóñêàòíûì àðîìàòîì. Ñàõàðèñòîñòü 17 %. Óðîæàéíîñòü âûñîêàÿ. Ïðîäóêöèîííûé ïåðèîä 139 äíåé ïðè ñóììå àêòèâíûõ òåìïåðàòóð 2900 °Ñ. Ïîáåãè âûçðåâàþò õîðîøî. Ñîðò ê ìèëäüþ, îèäèóìó è ñåðîé ãíèëè. Îòëè÷àåòñÿ âûñîêîé òðàíñïîðòàáåëüíîñòüþ è ëåæêîñòüþ, ïðåâîñõîäèò ñîðò Àãàäàè. Èñïîëüçóåòñÿ äëÿ ïîòðåáëåíèÿ â ñâåæåì âèäå è äëÿ ïðîèçâîäñòâà ìàðî÷íûõ âèí. Ìóñêàò Ìåëüíèêà. Êóñòû ñðåäíåé ñèëû ðîñòà. Ãðîçäè êðóïíûå, êîíè÷åñêèå, ïîëóïëîòíûå. ßãîäû êðóïíûå, ñëàáîîâàëüíûå, áåëûå. Ìÿêîòü ìÿñèñòî-ñî÷íàÿ, ñ ãàðìîíè÷íûì ñî÷åòàíèåì ñàõàðà è êèñëîòû è òîíêèì ìóñêàòíûì àðîìàòîì. Êîæèöà òîíêàÿ, ïðî÷íàÿ. Óðîæàéíîñòü ñðåäíÿÿ. Ïîâûøåííàÿ óñòîé÷èâîñòü ê ìèëäüþ, âîñïðèèì÷èâîñòü ê îèäèóìó. Ìîðîçîñòîéêîñòü -22.. .-23 °Ñ. Ìóñêàò óñòîé÷èâûé. Ãðîçäè ñðåäíèå, öèëèíäðè÷åñêèå, ïîëóïëîòíûå. ßãîäû ñðåäíèå, îêðóãëûå, áåëûå. Ìÿêîòü ìÿñèñòî-ñî÷íàÿ, ñ ÿðêî âûðàæåííûì ìóñêàòíûì àðîìàòîì. Ñàõàðèñòîñòü 20%, êèñëîòíîñòü 4,6 ã/ë. Óðîæàéíîñòü âûñîêàÿ. Óñòîé÷èâ ê ìèëäüþ è ñåðîé ãíèëè. Ê îèäèóìó óñòîé÷èâîñòü ïîâûøåííàÿ. Ìîðîçîñòîéêîñòü -23...-24 °Ñ. Óðîæàé ìîæåò äîëãîå âðåìÿ îñòàâàòüñÿ íà êóñòàõ áåç óõóäøåíèÿ êà÷åñòâà. Èç ñîðòà ïðîèçâîäÿò ñîê è äåñåðòíîå âèíî âûñîêîãî êà÷åñòâà. Ìýðöèøîð. Êóñòû ñèëüíîðîñëûå. Ãðîçäè ñðåäíèå, ðåæå — êðóïíûå (300 ã), öèëèíäðî-êîíè÷åñêèå, ñðåäíåé ïëîòíîñòè. ßãîäû êðóïíûå (4—5 ã), îâàëüíûå, òåìíî-ñèíèå. Ìÿêîòü ìÿñèñòî-ñî÷íàÿ, ïðîñòîãî âêóñà. Ñàõàðèñòîñòü 15—16%, êèñëîòíîñòü 8—8,5 ã/ë. Äåãóñòàöèîííàÿ îöåíêà ñâåæåãî âèíîãðàäà 8,2—8,7 áàëëà. Óðîæàéíîñòü âûñîêàÿ (180 ö/ãà). Ïîáåãè âûçðåâàþò õîðîøî. Óñòîé÷èâîñòü ê ìèëäüþ è ñåðîé ãíèëè âûñîêàÿ (2 áàëëà), ê îèäèóìó — ïîâûøåííàÿ (3,5 áàëëà). Ìîðîçîñòîéêîñòü äî -25 °Ñ. Ñîðò òðàíñïîðòàáåëåí è õîðîøî âûäåðæèâàåò äëèòåëüíîå õðàíåíèå. Íàäåæäà ÀÇÎÑ. Êóñòû ñèëüíîðîñëûå. Ãðîçäè êðóïíûå (400—500 ã), âåòâèñòûå, ñðåäíåé ïëîòíîñòè èëè ðûõëûå. ßãîäû êðóïíûå (28x20 ìì, 6—8 ã), ÿéöåâèäíûå, òåìíî-ñèíèå, ñ ãóñòûì ïðóèíîì. Âêóñ ïðîñòîé, ãàðìîíè÷íûé. Ìÿêîòü ìÿñèñòàÿ. Ñàõàðèñòîñòü 18%, êèñëîòíîñòü 6,8 ã/ë. Äåãóñòàöèîííàÿ îöåíêà 8,4—8,9 áàëëà. Óñòîé÷èâ ê ìèëäüþ (3 áàëëà), ñåðîé ãíèëè, èìååò ïîâûøåííóþ óñòîé÷èâîñòü ê îèäèóìó (3,5 áàëëà). Óðîæàéíîñòü 160 ö/ãà. Âûñîêèå ïîêàçàòåëè òðàíñïîðòàáåëüíîñòè è òîâàðíîñòè. Ñîçðåâàåò âî 2-é ïîëîâèíå àâãóñòà. Íåïòóí. Êóñòû ñðåäíåðîñëûå. Ãðîçäè êðóïíûå è î÷åíü êðóïíûå, âåòâèñòûå, ñðåäíåïëîòíûå è ðûõëûå. ßãîäû î÷åíü êðóïíûå, ñëàáî-îâàëüíûå èëè ïðîäîëãîâàòûå, êðàñíî-ôèîëåòîâûå. Ìÿêîòü ìÿñèñòî-ñî÷íàÿ, òåðïêîâàòîãî ïðèÿòíîãî âêóñà. Óðîæàéíîñòü âûñîêàÿ. Óñòîé÷èâ ê ìèëäüþ, ñåðîé ãíèëè, íî âîñïðèèì÷èâ ê îèäèóìó. Ìîðîçîñòîéêîñòü -23...-24 °Ñ. Ñîðò òðàíñïîðòàáåëüíûé, õîðîøî õðàíèòñÿ. Íèìðàíã. Ñðåäíåàçèàòñêèé ñòîëîâûé ñîðò ñðåäíåïîçäíåãî ñðîêà ñîçðåâàíèÿ. Âåãåòàöèîííûé ïåðèîä 150-155 äíåé. Êóñò ñèëüíîðîñëûé. Ëîçà âûçðåâàåò õîðîøî. Ãðîçäè êðóïíûå è î÷åíü êðóïíûå. ßãîäû îâàëüíûå, çåëåíîâàòî-æåëòûå ñ êðàñíûì ïîëîñàòûì ðóìÿíöåì íà ñîëíå÷íîé ñòîðîíå. Ñîðò èìååò ôóíêöèîíàëüíî-æåíñêèé òèï öâåòêà. Ëó÷øèå îïûëèòåëè: Ñàïåðàâè, Ìóñêàò âåíãåðñêèé, Êèøìèø ÷åðíûé. Óðîæàéíîñòü 100-150, à èíîãäà 250 öåíòíåðîâ ñ ãåêòàðà (ö/ãà). Âûñîêèé óðîæàé ìîæíî ïîëó÷èòü íà ìîùíûõ ôîðìèðîâêàõ, ïðè äëèííîé îáðåçêå îäíîëåòíèõ ëîç. Íèìðàíã Ìàãàðà÷à. Êóñòû ñðåäíåé ñèëû ðîñòà. Ãðîçäè êðóïíûå (400—600 ã), êîíè÷åñêèå, ñðåäíåé ïëîòíîñòè. ßãîäû êðóïíûå, îêðóãëûå, áåëûå, ïðè ïîëíîì ñîçðåâàíèè ÿíòàðíûå. Êîæèöà òîëñòàÿ. Ìÿêîòü õðóñòÿùàÿ, ñ ïðèÿòíûì ïðèâêóñîì. Ñàõàðèñòîñòü 17—18 %, êèñëîòíîñòü 6—7 ã/ë. Äåãóñòàöèîííàÿ îöåíêà 8,2 áàëëà. Óðîæàéíîñòü âûñîêàÿ (150— 200 ö/ãà). Ïîáåãè âûçðåâàþò õîðîøî. Óñòîé÷èâîñòü ê ìèëäüþ, ñåðîé ãíèëè, êîðíåâîé ôèëëîêñåðå âûñîêàÿ (2 áàëëà), ê îèäèóìó è àíòðàêíîçó — ïîâûøåííàÿ. Ìîðîçîñòîéêîñòü äî -24 °Ñ. Îòëè÷àåòñÿ õîðîøåé òðàíñïîðòàáåëüíîñòüþ è ëåæêîñòüþ ïðè õðàíåíèè. Íèñòðó. Êóñòû ñðåäíåé ñèëû ðîñòà. Ãðîçäè î÷åíü êðóïíûå (700—800 ã), öèëèíäðî-êîíè÷åñêèå, ñðåäíåé ïëîòíîñòè èëè ïëîòíûå. ßãîäû êðóïíûå (7,5 ã), îâàëüíûå, æåëòîâàòî-çåëåíûå ñ ðîçîâèíêîé. Êîæèöà òîíêàÿ, íî äîâîëüíî ïðî÷íàÿ. Ìÿêîòü ìÿñèñòàÿ, õðóñòÿùàÿ. Ñàõàðèñòîñòü 16%, êèñëîòíîñòü 8 ã/ë. Äåãóñòàöèîííàÿ îöåíêà ñâåæåãî âèíîãðàäà 8,3 áàëëà. Óðîæàéíîñòü 150 ö/ãà. Ïîáåãè âûçðåâàþò õîðîøî. Îáëàäàåò ïîëåâîé óñòîé÷èâîñòüþ ê ìèëäüþ, îèäèóìó, àíòðàêíîçó. êîðíåâîé ôèëëîêñåðå (ïî 2 áàëëà), à òàêæå ê ñåðîé ãíèëè (3 áàëëà). Ñîðò òðàíñïîðòàáåëüíûé è ëåæêèé — ìîæåò õðàíèòüñÿ áåç ïîòåðü â òå÷åíèå 4—5 ìåñÿöåâ. Ñîçðåâàåò â íà÷àëå îêòÿáðÿ. Ïðîäîëæèòåëüíîñòü ïåðèîäà îò ðàñïóñêàíèÿ ïî÷åê äî ñîçðåâàíèÿ ÿãîä 165—175 äíåé. Íîâîñåëîâñêèé. Êóñòû ðîñëûå. Ãðîçäè ñðåäíèå. ßãîäû ñðåäíèå, ôèîëåòîâî-÷åðíûå. Ìÿêîòü ìÿñèñòî-ñî÷íàÿ, ñ ñèëüíûì ìóñêàòíûì àðîìàòîì. Óðîæàéíîñòü ñðåäíÿÿ. Ïîáåãè âûçðåâàþò õîðîøî. Óñòîé÷èâîñòü ê ìèëäüþ, îèäèóìó, ñåðîé ãíèëè âûñîêàÿ (2 áàëëà). Ìîðîçîñòîéêîñòü ïîâûøåííàÿ. Ïðèãîäåí äëÿ äëèòåëüíîãî õðàíåíèÿ. Îðèãèíàë. Êóñòû ñèëüíîðîñëûå. Ãðîçäè êðóïíûå (300— 400 ã), öèëèíäðî-êîíè÷åñêèå è êðûëàòûå, ðûõëûå, î÷åíü êðàñèâûå. ßãîäû êðóïíûå (36 õ 17 ìì, 6—7 ã), óäëèíåííî-ÿéöåâèäíîé èëè ñîñêîâèäíîé ôîðìû. Öâåò ÿãîä îò áëåäíî-ðîçîâîãî äî ðîçîâî-êðàñíîãî â çàâèñèìîñòè îò îñâåùåííîñòè. Ìÿêîòü ìÿñèñòàÿ, ïëîòíàÿ, ãàðìîíè÷íîãî âêóñà. Êîæèöà òîíêàÿ, ðâóùàÿñÿ. Ñàõàðèñòîñòü 19 %, êèñëîòíîñòü 6 ã/ë. Äåãóñòàöèîííàÿ îöåíêà 8,5 áàëëà. Ñîðò óðîæàéíûé (140 ö/ãà). Ïîáåãè âûçðåâàþò õîðîøî. Îò ðàñïóñêàíèÿ ïî÷åê äî çðåëîñòè ÿãîä òðåáóåòñÿ 140 äíåé ïðè ñóììå àêòèâíûõ òåìïåðàòóð 2737 °Ñ. Óñòîé÷èâ ê ñåðîé ãíèëè (2,5 áàëëà), ìèëäüþ (3 áàëëà), òîëåðàíòåí ê ôèëëîêñåðå (3 áàëëà). Òðàíñïîðòàáåëüíîñòü ñðåäíÿÿ, òîâàðíîñòü è ëåæêîñòü õîðîøèå. Îñåííèé ÷åðíûé. Êóñòû ñèëüíîðîñëûå. Ãðîçäè êðóïíûå (500—700 ã), êîíè÷åñêèå, ñðåäíåé ïëîòíîñòè. ßãîäû î÷åíü êðóïíûå (7—8 ã), ïðîäîëãîâàòûå èëè îáðàòíî-ÿéöåâèäíûå, ÷åðíûå ñ ïðóèíîì. Ìÿêîòü ìÿñèñòî-ñî÷íàÿ, ïðîñòîãî âêóñà. Ñðåäè óñòîé÷èâûõ ñîðòîâ ýòî îäèí èç íàèáîëåå êðóïíîïëîäíûõ. Óðîæàéíîñòü âûñîêàÿ. Óñòîé÷èâ ê ìèëäüþ (2,5 áàëëà). Ìîðîçîñòîéêîñòü äî -24 °Ñ. Èìååò õîðîøóþ òîâàðíîñòü è òðàíñïîðòàáåëüíîñòü. Ïàìÿòè Âåðäåðåâñêîãî. Êóñòû ñèëüíîðîñëûå. Ãðîçäè ñðåäíèå è êðóïíûå (300—400 ã), êîíè÷åñêèå èëè âåòâèñòûå, ñðåäíåé ïëîòíîñòè, íàðÿäíûå. ßãîäû êðóïíûå (6—7 ã), ÿéöåâèäíûå, çåëåíîâàòî-æåëòûå. Ìÿêîòü ìÿñèñòàÿ, õðóñòÿùàÿ. Âêóñ ïðîñòîé, ãàðìîíè÷íûé. Ñàõàðèñòîñòü 16—18 %, êèñëîòíîñòü 7—8 ã/ë. Äåãóñòàöèîííàÿ îöåíêà ñâåæåãî âèíîãðàäà 7,8— 8,1 áàëëà. Óðîæàéíîñòü 160—180 ö/ãà. Âûçðåâàíèå ïîáåãîâ õîðîøåå. Óñòîé÷èâ ê ìèëäüþ, ïàóòèííîìó êëåùó. Ïîâûøåíà óñòîé÷èâîñòü ê îèäèóìó, ôèëëîêñåðå è ëèñòîâåðòêå. Óñòîé÷èâîñòüþ ê ñåðîé ãíèëè ÿãîä íå îòëè÷àåòñÿ. Ìîðîçîñòîéêîñòü äî -23 °Ñ. Ñîðò òðàíñïîðòàáåëüíûé, ìîæåò õðàíèòüñÿ áåç ïîòåðü â òå÷åíèå 3—4 ìåñÿöåâ. Ñîçðåâàåò â êîíöå ñåíòÿáðÿ — íà÷àëå îêòÿáðÿ. Ïðîäîëæèòåëüíîñòü ïðîäóêöèîííîãî ïåðèîäà 160—170 äíåé. Ïàìÿòè Íåãðóëÿ. Êóñòû ñèëüíîðîñëûå. Ãðîçäè êðóïíûå (500 ã), öèëèíäðî-êîíè÷åñêèå, ðûõëûå. ßãîäû êðóïíûå (6—7 ã), äëèííûå ñ çàîñòðåííûì êîí÷èêîì, ôèîëåòîâûå ñ ãóñòûì ïðóèíîì. Êîæèöà ïëîòíàÿ, õðóñòÿùàÿ. Ìÿêîòü ìÿñèñòî-ñî÷íàÿ, âêóñ ïðîñòîé, ãàðìîíè÷íûé. Ñàõàðèñòîñòü 16—17%, êèñëîòíîñòü 6—7 ã/ë. Óðîæàéíîñòü âûñîêàÿ (180— 200 ö/ãà). Ïîáåãè âûçðåâàþò õîðîøî. Óñòîé÷èâ ê ìèëäüþ, ñåðîé ãíèëè, òîëåðàíòåí ê ôèëëîêñåðå. Ìîðîçîñòîéêîñòü ïîâûøåííàÿ (-25 °Ñ). Ñîðò îòëè÷àåòñÿ õîðîøåé òðàíñïîðòàáåëüíîñòüþ è ëåæêîñòüþ ïðè çèìíåì õðàíåíèè äî 130 äíåé, èìååò âûñîêèå òîâàðíûå êà÷åñòâà. Ñâåòëûé. Êóñòû ñèëüíîðîñëûå. Ãðîçäè áîëüøèå, íàðÿäíûå, âåòâèñòûå, ðûõëûå èëè ñðåäíåïëîòíûå. ßãîäû î÷åíü êðóïíûå (8—10 ã), ÿéöåâèäíî-óäëèíåííûå, çåëåíîâàòî-æåëòûå ñ ëåãêèì âîñêîâûì íàëåòîì. Êîæèöà ïðî÷íàÿ, òîíêàÿ. Ìÿêîòü ìÿñèñòî-ñî÷íàÿ, õðóñòÿùàÿ. Âêóñ ïðîñòîé, ãàðìîíè÷íûé. Óðîæàéíîñòü âûñîêàÿ. Ïîáåãè õîðîøî âûçðåâàþò. Ïîâûøåííàÿ óñòîé÷èâîñòü ê ìèëäüþ, îèäèóìó, ñåðîé ãíèëè, ôèëëîêñåðå, ìîðîçàì. Ñîðò òðàíñïîðòàáåëüíûé, õîðîøî õðàíèòñÿ. Ïàìÿòè Êîòîâñêîãî. Êóñòû ñèëüíîðîñëûå. Ãðîçäè êðóïíûå (400 ã), êîíè÷åñêèå, ñðåäíåé ïëîòíîñòè. ßãîäû êðóïíûå (6 ã), ïðîäîëãîâàòûå, áåëûå. Êîæèöà òîíêàÿ. Âêóñ ïðîñòîé. Äåãóñòàöèîííàÿ îöåíêà ñâåæåãî âèíîãðàäà 8,2 áàëëà. Ñîðò óðîæàéíûé, íà 1 ïîáåã ïðèõîäèòñÿ â ñðåäíåì 1,3 ñîöâåòèÿ. Óñòîé÷èâ ê ìèëäüþ. Èìååò ïîâûøåííóþ óñòîé÷èâîñòü ê îèäèóìó. Ïîáåäà. Ñîðò õàðàêòåðèçóåòñÿ êðóïíûìè ãðîçäüÿìè (700— 1000 ã) è î÷åíü êðóïíûìè ÷åðíûìè ÿãîäàìè (9—20 ã). Ìÿêîòü ïëîòíàÿ, õðóñòÿùàÿ, ñ õîðîøèì ñî÷åòàíèåì ñàõàðà è êèñëîòû; òðàíñïîðòàáåëüíîñòü âûñîêàÿ. Âåãåòàöèîííûé ïåðèîä 145—150 äíåé. Óðîæàéíîñòü 200 ö/ãà. Êóñòû ïðè îðîøåíèè ñèëüíîðîñëûå, íà áîãàðå — ñðåäíèå. Ïî÷êè íà ëîçå ðàñïîëîæåíû ãóñòî, ïëîäîíîñíîñòü èõ âûñîêàÿ. Ïîýòîìó âûñîêèå óðîæàè êóñòû ïðèíîñÿò êàê ïðè äëèííîé, òàê è ïðè êîðîòêîé îáðåçêå. Ïðè äëèííîé îáðåçêå ëåãêî ïåðåãðóæàåòñÿ óðîæàåì, ïîýòîìó òàêàÿ îáðåçêà âèíîãðàäà ïðèìåíÿåòñÿ ëèøü íà îðîøàåìûõ ó÷àñòêàõ. Ñîðò âîîáùå ëó÷øå óäàåòñÿ ïðè îðîøåíèè. Ïóõëÿêîâñêèé. Ïðîäîëæèòåëüíîñòü âåãåòàöèîííîãî ïåðèîäà îêîëî 150 äíåé. Âûçðåâàíèå ïîáåãîâ õîðîøåå. Êóñòû ñèëüíîðîñëûå. Óðîæàéíîñòü íåïîñòîÿííàÿ, íî âûñîêàÿ è çàâèñèò îò óñëîâèé îïûëåíèÿ. Ïîðàæàåòñÿ ãðèáêîâûìè áîëåçíÿìè. Ñîðò òðàíñïîðòàáåëüíûé, õîðîøî õðàíèòñÿ. Ëèñòüÿ äîâîëüíî êðóïíûå, 5-ëîïàñòíûå, âîðîíêîâèäíûå, ïîâåðõíîñòü ïëàñòèíêè ïóçûð÷àòàÿ. Öâåòêè ó ýòîãî ñîðòà âèíîãðàäà ôóíêöèîíàëüíî-æåíñêèå. Ëó÷øèå îïûëèòåëè: Øàñëà áåëàÿ, Ñåíñî, Ìóñêàò ãàìáóðãñêèé. Ãðîçäè ñðåäíèå, öèëèíäðè÷åñêèå, ÷àñòî êðûëàòûå, ìàññà â ñðåäíåì 135— 150 ã. ßãîäû êðóïíûå, îâàëüíî-ÿéöåâèäíûå ñ çàîñòðåííûì êîí÷èêîì, çåëåíîâàòî-áåëûå. Êîæèöà òîëñòàÿ, ïëîòíàÿ. Ìÿêîòü ñî÷íàÿ. Ñåìÿí â ÿãîäå 2—3. Ñàõàðèñòîñòü 18,5—19,1 %, êèñëîòíîñòü 5—8 ã/ë. Âèíîãðàä èñïîëüçóåòñÿ â ñâåæåì âèäå è äëÿ ïðèãîòîâëåíèÿ âèíà. Ðàííèé Âèðà. Ñîðò ðàííåãî ñðîêà ñîçðåâàíèÿ. Âåãåòàöèîííûé ïåðèîä 135—140 äíåé. Êóñòû ñèëüíîðîñëûå. Ëîçà âûçðåâàåò õîðîøî. Ãðîçäè ñðåäíèõ ðàçìåðîâ è êðóïíûå, ÿãîäû áåëûå, êðóïíûå, ìÿêîòü ñî÷íàÿ, îñâåæàþùàÿ. Óðîæàéíîñòü âûñîêàÿ (äî 200 ö/ãà). Ðîìóëóñ. Àìåðèêàíñêèé áåññåìÿííûé ñîðò ðàííåñðåäíåãî èëè ðàííåãî ñðîêà ñîçðåâàíèÿ. Ãðîçäè êðóïíûå (400 ã). ßãîäû ñðåäíèå (2—3 ã), îâàëüíûå, áåëûå, ñ èçàáåëüíûì âêóñîì. 18 %, êèñëîòíîñòü 8 ã/ë. Óñòîé÷èâ ê ãðèáêîâûì áîëåçíÿì. Ìîðîçîñòîéêîñòü äî -27 °Ñ. Òðàíñïîðòàáåëüíîñòü íåâûñîêàÿ. Ðóìåíý. Ñðåäíåðîñëûé. Ãðîçäè êðóïíûå (400 ã), öèëèíäðî-êîíè÷åñêèå, ñðåäíåé ïëîòíîñòè. ßãîäû êðóïíûå (28 X 19 ìì, 6—7 ã), óäëèíåííûå, ðîçîâûå, êðàñèâûå. Âêóñ ïðîñòîé. Óðîæàéíîñòü 142 ö/ãà. Îáëàäàåò ãðóïïîâîé óñòîé÷èâîñòüþ ê âðåäèòåëÿì è áîëåçíÿì. Òîâàðíîñòü âûñîêàÿ, òðàíñïîðòàáåëüíîñòü íèçêàÿ. Ðóñáîë. Êóñòû ñèëüíîðîñëûå. Ãðîçäè êðóïíûå (350—400 ã), êîíè÷åñêèå, ñðåäíåé ïëîòíîñòè. ßãîäû ñðåäíèå (10—18 X 14— 15 ìì, 2—2,5 ã), îâàëüíûå, áåëûå, ïðè ïîëíîì ñîçðåâàíèè ÿíòàðíûå, áåññåìÿííûå. Ñàõàðèñòîñòü 18,5 %, êèñëîòíîñòü 6,7 ã/ë. Îáëàäàåò ìîðîçîñòîéêîñòüþ äî -25 °Ñ, âûñîêîé óñòîé÷èâîñòüþ ê ìèëäüþ (2,5 áàëëà), ïîâûøåííîé óñòîé÷èâîñòüþ ê ñåðîé ãíèëè (3,5 áàëëà). Ïîáåãè îòëè÷íî âûçðåâàþò. Óðîæàéíîñòü î÷åíü âûñîêàÿ. Ñîçðåâàåò âî 2-é äåêàäå àâãóñòà. Èñïîëüçóåòñÿ äëÿ ïîòðåáëåíèÿ â ñâåæåì âèäå, ñóøêè, ïðèãîòîâëåíèÿ âàðåíüÿ. Ðóñâåí. Êóñòû ñðåäíåðîñëûå. Ãðîçäè êðóïíûå (300—400 ã), öèëèíäðè÷åñêèå, ïîëóïëîòíûå. ßãîäû êðóïíûå (24 õ 25 ìì, 5—6 ã), îêðóãëûå èëè íåìíîãî ñïëþñíóòûå, ñëàáî-ðîçîâûå, ñ ìóñêàòíûì àðîìàòîì. Ñàõàðèñòîñòü 20,3%, êèñëîòíîñòü 8,1 ã/ë. Ñîðò óðîæàéíûé, îòëè÷àåòñÿ óñòîé÷èâîñòüþ ê ìèëäüþ (2,5—3 áàëëà) è ìîðîçó (äî -25 °Ñ). Ðóñìîë. Êóñòû ñèëüíîðîñëûå. Ãðîçäè î÷åíü êðóïíûå (600— 700 ã), êîíè÷åñêèå, ïîëóïëîòíûå. ßãîäû î÷åíü êðóïíûå (32x23 ìì, 7—8 ã), îêðóãëûå, áåëûå. Ìÿêîòü ìÿñèñòî-ñî÷íàÿ, ñ ëåãêèì ìóñêàòíûì àðîìàòîì. Êîæèöà ïëîòíàÿ. Ñàõàðèñòîñòü 17,4%, êèñëîòíîñòü 8,5 ã/ë. Âûçðåâàíèå ïîáåãîâ õîðîøåå. Óðîæàéíîñòü âûñîêàÿ. Óñòîé÷èâ ê ìèëäüþ, ñåðîé ãíèëè, ôèëëîêñåðå (2,5 áàëëà). Ìîðîçîñòîéêîñòü ïîâûøåííàÿ. Òðàíñïîðòàáåëüíîñòü ñðåäíÿÿ. Ðóññêèé ðàííèé. Êóñòû ñðåäíåðîñëûå. Ãðîçäè ñðåäíèå (250 ã), êîíè÷åñêèå, ñðåäíåé ïëîòíîñòè èëè ðûõëûå. ßãîäû ñðåäíèå è êðóïíûå (21 õ 20 ìì, 3—4 ã), îêðóãëûå, òåìíî-ðîçîâûå, õîðîøåãî âêóñà. Ñàõàðèñòîñòü 16—18 %, êèñëîòíîñòü 6 7 ã/ë. Ñîðò óðîæàéíûé. Óñòîé÷èâîñòü ê ìèëäüþ 2,5-3 áàëëà, ìîðîçîñòîéêîñòü äî -23 °Ñ. Íåóñòîé÷èâ ê îèäèóìó, ïàóòèííîìó êëåùó, ôèëëîêñåðå. Ðóññêèé ÿíòàðü. Êóñòû ñðåäíåé ñèëû ðîñòà. Ãðîçäè ñðåäíèå è êðóïíûå (350 ã), êîíè÷åñêèå, ÷àñòî ñ êðûëîì, ñðåäíåé ïëîòíîñòè. ßãîäû êðóïíûå (24 õ 19 ìì, 5 ã), îâàëüíûå, ÿíòàðíî-æåëòûå. Ìÿêîòü õðóñòÿùàÿ, ïðèÿòíîãî âêóñà ñ òîíêèì ìóñêàòíûì àðîìàòîì. Ñàõàðîíàêîïëåíèå âûñîêîå. Î÷åíü óðîæàéíûé. Óñòîé÷èâîñòü ê ñåðîé ãíèëè, ðàñòðåñêèâàíèþ ÿãîä ïîâûøåííàÿ, ê ìèëäüþ 2,5—3 áàëëà. Ìîðîçîñòîéêîñòü -22...-24 °Ñ. Ñàìàíòà. Êóñòû ñðåäíåðîñëûå. Ãðîçäè êðóïíûå (350 ã), øèðîêîêîíè÷åñêèå. ßãîäû êðóïíûå (6 ã), îâàëüíûå, ðîçîâî-ôèîëåòîâîé îêðàñêè. Ìÿêîòü ìÿñèñòàÿ, õðóñòÿùàÿ. Ñàõàðèñòîñòü 17%, êèñëîòíîñòü 5 ã/ë. Óðîæàéíîñòü 130 ö/ãà. Óñòîé÷èâîñòü ê ìèëäüþ âûñîêàÿ, ê îèäèóìó, ñåðîé ãíèëè — ïîâûøåííàÿ. Ïëîäû îòëè÷àþòñÿ âûñîêîé òîâàðíîñòüþ è òðàíñïîðòàáåëüíîñòüþ. Ñåíñî. Õîðîøèé ñòîëîâûé ñîðò ñðåäíåïîçäíåãî ñðîêà ñîçðåâàíèÿ. Êóñò ñðåäíåðîñëûé. Ëîçà âûçðåâàåò íà 80%. Ãðîçäè ñðåäíåé âåëè÷èíû, ÿãîäû êðóïíûå, ÷åðíîãî öâåòà, ìÿêîòü ìÿñèñòî-ñî÷íàÿ, õðóñòÿùàÿ, ïðèÿòíîãî âêóñà. Óðîæàéíîñòü 60—80, à èíîãäà äîñòèãàåò 120 ö/ãà. Ñìåíà. Êóñòû ñðåäíåðîñëûå. Ãðîçäè ñðåäíèå è êðóïíûå (350—400 ã), êîíè÷åñêèå, âåòâèñòûå, ðûõëûå. ßãîäû êðóïíûå (5-6 ã) , óäëèíåííûå, áåëûå. Ìÿêîòü ìÿñèñòî-ñî÷íàÿ, ïðîñòîãî âêóñà. Ïîáåãè âûçðåâàþò õîðîøî. Óðîæàéíîñòü 140 ö/ãà. Ïðîäîëæèòåëüíîñòü ïðîäóêöèîííîãî ïåðèîäà 140 äíåé ïðè ñóììå àêòèâíûõ òåìïåðàòóð 2685 °Ñ. Óñòîé÷èâîñòü ê ñåðîé ãíèëè 2 áàëëà, ê ìèëäüþ 3 áàëëà, ê îèäèóìó 3,5 áàëëà. Ìîðîçîñòîéêîñòü ïîâûøåííàÿ, äî -24 °Ñ. Òîâàðíîñòü, òðàíñïîðòàáåëüíîñòü è ëåæêîñòü õîðîøèå. Ñìóãëÿíêà ìîëäàâñêàÿ. Êóñòû ñèëüíîðîñëûå. Ãðîçäè êðóïíûå (400—500 ã), êîíè÷åñêèå, ðûõëûå. ßãîäû êðóïíûå (5—7 ã), óäëèíåííûå, ÷åðíûå ñ ãóñòûì ïðóèíîì. Êîæèöà ïëîòíàÿ. Ìÿêîòü ìÿñèñòî-ñî÷íàÿ, âêóñ ïðîñòîé. Ñàõàðèñòîñòü 17%, êèñëîòíîñòü 7 ã/ë. Äåãóñòàöèîííàÿ îöåíêà âèíîãðàäà 8,1 áàëëà. Óðîæàéíîñòü 130—140 ö/ãà. Ñîðò îáëàäàåò âûñîêîé óñòîé÷èâîñòüþ ê ìèëäüþ è îèäèóìó (2 áàëëà), ìîðîçàì (-25 °Ñ), à òàêæå óñòîé÷èâ ê àíòðàêíîçó è ñåðîé ãíèëè (3 áàëëà). Ïðîäîëæèòåëüíîñòü ïðîäóêöèîííîãî ïåðèîäà 150—160 äíåé. Ñîëíå÷íûé. Êóñòû ñðåäíåðîñëûå. Ãðîçäè êðóïíûå (450 ã), êîíè÷åñêèå, ñðåäíåé ïëîòíîñòè. ßãîäû êðóïíûå, îêðóãëûå, æåëòî-çåë¸íûå. Ìÿêîòü ìÿñèñòî-ñî÷íàÿ, ñ ëåãêèì ìóñêàòíûì àðîìàòîì. Ñàõàðèñòîñòü 17%, êèñëîòíîñòü 7,2 ã/ë. Äåãóñòàöèîííàÿ îöåíêà ñâåæåãî âèíîãðàäà 8,5 áàëëà. Óðîæàéíîñòü ñðåäíÿÿ. Ïðîäîëæèòåëüíîñòü ïðîäóêöèîííîãî ïåðèîäà 138 äíåé ïðè ñóììå àêòèâíûõ òåìïåðàòóð 2700 °Ñ. Óñòîé÷èâ ê ìèëäüþ, îèäèóìó, ñåðîé ãíèëè ÿãîä. Òðàíñïîðòàáåëüíîñòü õîðîøàÿ. Ñîóê-Ñó. Êóñòû ñðåäíåé ñèëû ðîñòà. Ãðîçäè êðóïíûå è î÷åíü êðóïíûå, âåòâèñòûå, ðûõëûå. ßãîäû î÷åíü êðóïíûå, îêðóãëûå, ÿíòàðíûå. Ìÿêîòü ìÿñèñòî-ñî÷íàÿ, íåæíàÿ, ïðèÿòíîãî âêóñà. Óðîæàéíîñòü âûñîêàÿ. Óñòîé÷èâ ê îèäèóìó è ñåðîé ãíèëè. Ê ìèëäüþ óñòîé÷èâîñòü ïîâûøåííàÿ. Ìîðîçîñòîéêîñòü -21...-22 °Ñ. Ñïóòíèê. Êóñòû ñèëüíîðîñëûå. Ãðîçäè ñðåäíèå (200— 300 ã). ßãîäû êðóïíûå (4—5 ã), òåìíî-ôèîëåòîâûå, îâàëüíûå èëè îâàëüíî-óäëèíåííûå. Ìÿêîòü ìÿñèñòàÿ, âêóñ ïðîñòîé, ãàðìîíè÷íûé. Óðîæàéíîñòü ñðåäíÿÿ. Ìîðîçîñòîéêîñòü äî -25 °Ñ. Óñòîé÷èâîñòü ê ìèëäüþ âûñîêàÿ (2 áàëëà). Ê ñåðîé ãíèëè óñòîé÷èâîñòè íåò. Ñòàðòîâûé. Êóñòû ñðåäíåðîñëûå. Ãðîçäè êðóïíûå (550 ã), êîíè÷åñêèå, ïëîòíûå èëè ñðåäíåé ïëîòíîñòè. ßãîäû êðóïíûå (4—5 ã), îêðóãëûå, çåëåíîâàòî-æåëòûå ñ èíòåíñèâíûì ðîçîâûì çàãàðîì è ñåðûì âîñêîâûì íàëåòîì. Ìÿêîòü ìÿñèñòî-ñî÷íàÿ, î÷åíü õîðîøåãî âêóñà ñ ÿðêî âûðàæåííûì ìóñêàòíûì àðîìàòîì. Êîæèöà ïëîòíàÿ. Ñàõàðèñòîñòü 19%, êèñëîòíîñòü 7—8 ã/ë. Äåãóñòàöèîííàÿ îöåíêà 8,5 áàëëà. Ïîáåãè âûçðåâàþò õîðîøî. Óðîæàéíîñòü 130 ö/ãà. Óñòîé÷èâîñòü ê ìèëäüþ, ñåðîé ãíèëè âûñîêàÿ. Òîëåðàíòåí ê ôèëëîêñåðå. Ìîðîçîñòîéêîñòü äî -25 °Ñ. Ñòðàøåíñêèé. Êóñòû ñèëüíîðîñëûå. Ãðîçäè î÷åíü êðóïíûå (800 ã â ñðåäíåì), öèëèíäðè÷åñêîé èëè öèëèíäðî-êîíè÷åñêîé ôîðìû, ñðåäíåé ïëîòíîñòè è ðûõëûå. ßãîäû î÷åíü êðóïíûå (31 õ28 ìì, 8—10 ã), îêðóãëûå, òåìíî-ôèîëåòîâûå ñ ãóñòûì ïðóèíîì. Êîæèöà òîíêàÿ, íåæíàÿ, ìÿêîòü ìÿñèñòî-ñî÷íàÿ, õîðîøåãî âêóñà. Ñàõàðèñòîñòü 18—19%, êèñëîòíîñòü 7—8 ã/ë. Ñîðò î÷åíü óðîæàéíûé (250 ö/ãà). Ïëîäîíîñÿò ïîáåãè, âûðîñøèå èç çàìåùàþùèõ èëè ñïÿùèõ ïî÷åê. Ïîáåãè âûçðåâàþò õîðîøî. Óñòîé÷èâîñòü ê ìèëäüþ 3 áàëëà. Âîñïðèèì÷èâ ê ñåðîé ãíèëè. Ïîðàæàåòñÿ îèäèóìîì. Òîëåðàíòåí ê ôèëëîêñåðå. Ìîðîçîñòîéêîñòü ïîâûøåííàÿ. Òðàíñïîðòàáåëüíîñòü ñðåäíÿÿ, òîâàðíîñòü âûñîêàÿ. Ñòðóãóðàø. Êóñòû ñèëüíîðîñëûå. Ãðîçäè êðóïíûå (400 ã), êîíè÷åñêèå, ñðåäíåé ïëîòíîñòè èëè ðûõëûå. ßãîäû êðóïíûå (5—6 ã), îâàëüíûå, òåìíî-ôèîëåòîâûå ñ ãóñòûì ïðóèíîì. Êîæèöà ïëîòíàÿ, ïðî÷íàÿ. Ìÿêîòü ìÿñèñòî-ñî÷íàÿ, âêóñ ïðîñòîé. Ñàõàðèñòîñòü 18—19%, êèñëîòíîñòü 8 ã/ë. Äåãóñòàöèîííàÿ îöåíêà 8 áàëëîâ. Óðîæàéíîñòü âûñîêàÿ (200 ö/ãà). Âûçðåâàíèå ïîáåãîâ õîðîøåå. Óñòîé÷èâîñòü ê ìèëäüþ, îèäèóìó, ñåðîé ãíèëè âûñîêàÿ (2 áàëëà). Òîëåðàíòåí ê ôèëëîêñåðå. Ìîðîçîñòîéêîñòü ïîâûøåííàÿ (-24 °Ñ). Ñîðò îáëàäàåò âûñîêîé òðàíñïîðòàáåëüíîñòüþ è îòëè÷íîé ëåæêîñòüþ ïðè õðàíåíèè (äî 180 ñóòîê). Ïðîäîëæèòåëüíîñòü ïðîäóêòèâíîãî ïåðèîäà — 165 äíåé. Ñóâåíèð ìåðíûé. Ñèíîíèìû: Îäåññêèé ñóâåíèð, Ñóâåíèð. Êóñòû ñèëüíîðîñëûå. Ãðîçäè ñðåäíèå è êðóïíûå (400 ã), êîíè÷åñêèå, ñðåäíåé ïëîòíîñòè èëè ðûõëûå, î÷åíü íàðÿäíûå. ßãîäû êðóïíûå (40 õ 18 ìì, 5—7 ã), îðèãèíàëüíîé ÿéöåâèäíî-ïðîäîëãîâàòîé ôîðìû ñ ïåðåõâàòîì èëè ñîñêîâèäíûå, ÷åðíûå. Ìÿêîòü ïëîòíàÿ, âêóñ ãàðìîíè÷íûé, ïðîñòîé. Êîæèöà òîëñòàÿ, ïðî÷íàÿ. Ñàõàðèñòîñòü 15—16%, êèñëîòíîñòü 7— 8 ã/ë. Äåãóñòàöèîííàÿ îöåíêà ñâåæåãî âèíîãðàäà 8,4 áàëëà. Âûçðåâàíèå ïîáåãîâ õîðîøåå. Ñîðò óðîæàéíûé. Îòëè÷àåòñÿ ïîâûøåííîé óñòîé÷èâîñòüþ ê ñåðîé ãíèëè, îèäèóìó, ãðîçäåâîé ëèñòîâåðòêå. Òðàíñïîðòàáåëüíîñòü õîðîøàÿ. Òîâàðíîñòü âûñîêàÿ. Ïðèãîäåí äëÿ çèìíåãî õðàíåíèÿ. Ïðîäîëæèòåëüíîñòü ïðîäóêöèîííîãî ïåðèîäà 142 äíÿ ïðè ñóììå àêòèâíûõ òåìïåðàòóð 2662 °Ñ. Ñóðó÷åíñêèé áåëûé. Ñòîëîâî-òåõíè÷åñêèé ñîðò. Êóñòû ñèëüíîðîñëûå. Ãðîçäè ñðåäíèå è êðóïíûå (300 ã). ßãîäû ñðåäíèå è êðóïíûå (18—20 ìì, 3—4 ã), îêðóãëûå, áåëûå. Êîæèöà òîíêàÿ, íî äîâîëüíî ïðî÷íàÿ. Ìÿêîòü ñî÷íàÿ, íàïîìèíàåò Øàñëó áåëóþ. Ñàõàðèñòîñòü 18—20%, êèñëîòíîñòü 8— 8,5 ã/ë. Óðîæàéíîñòü âûñîêàÿ (160—190 ö/ãà). Ïîáåãè õîðîøî âûçðåâàþò. Ñîðò ìîðîçîñòîéêèé, âûäåðæèâàåò ìîðîçû äî -28 °Ñ, óñòîé÷èâ ê ìèëäüþ (2 áàëëà), îèäèóìó (2 áàëëà), àíòðàêíîçó (2 áàëëà), ñåðîé ãíèëè (3 áàëëà), êîðíåâîé ôèëëîêñåðå (3 áàëëà). Ïðîäîëæèòåëüíîñòü ïðîäóêöèîííîãî ïåðèîäà 150 äíåé ïðè ñóììå àêòèâíûõ òåìïåðàòóð 2760 °Ñ. Æåëàòåëüíî èñïîëüçîâàòü êðóïíûå ôîðìèðîâêè. Òàèð. Êóñòû ñèëüíîðîñëûå. Ãðîçäè êðóïíûå (500—600 ã), ñðåäíåé ïëîòíîñòè èëè ðûõëûå. ßãîäû êðóïíûå (5—6 ã), óäëèíåííî-ÿéöåâèäíîé ôîðìû, ÷åðíûå ñ ãóñòûì ïðóèíîì. Ìÿêîòü ìÿñèñòî-ñî÷íàÿ, âêóñ ïðîñòîé, ïðèÿòíûé. Êèñëîòíîñòü íèçêàÿ, ÷òî ïîçâîëÿåò óïîòðåáëÿòü ÿãîäû íà 2 íåäåëè ðàíüøå. Äëÿ ñîçðåâàíèÿ ÿãîä òðåáóåòñÿ ñóììà àêòèâíûõ òåìïåðàòóð 2728 "Ñ. Óðîæàéíîñòü î÷åíü âûñîêàÿ, îñîáåííî íà êðóïíûõ ôîðìèðîâêàõ. Ëîçà âûçðåâàåò õîðîøî. Óñòîé÷èâîñòü ê ñåðîé ãíèëè 2 áàëëà; ê ìèëäüþ, îèäèóìó è ôèëëîêñåðå — 3 áàëëà. Ìîðîçîñòîéêîñòü ïîâûøåííàÿ (äî -23 °Ñ). Òàèðîâñêèé îãîíåê. Êóñòû ñèëüíîðîñëûå. Ãðîçäè êðóïíûå (500 ã), êîíè÷åñêèå, ñðåäíåé ïëîòíîñòè, íàðÿäíûå. ßãîäû êðóïíûå (26 õ 20 ìì, 5—7 ã), îâàëüíûå, áëåäíî-ðîçîâûå ñ íåðàâíîìåðíîé îêðàñêîé. Êîæèöà òîíêàÿ, íåæíàÿ. Ìÿêîòü ìÿñèñòàÿ, õîðîøåãî âêóñà. Óðîæàéíîñòü âûñîêàÿ, îñîáåííî íà êðóïíûõ ôîðìèðîâêàõ. Ê ìèëäüþ óñòîé÷èâîñòü âûñîêàÿ (2—2,5 áàëëà). Ìîðîçîñòîéêîñòü -23...-24 °Ñ. Ïîðàæàåòñÿ ñåðîé ãíèëüþ. Ïîêàçàòåëè òîâàðíîñòè, òðàíñïîðòàáåëüíîñòè õîðîøèå. Òàéôè ðîçîâûé. Îäèí èç íàèáîëåå öåííûõ ñðåäíåàçèàòñêèõ ñòîëîâûõ ñîðòîâ ñðåäíåïîçäíåãî ñðîêà ñîçðåâàíèÿ. Âåãåòàöèîííûé ïåðèîä 150—155 äíåé. Êóñòû î÷åíü ìîùíûå. Ëîçà âûçðåâàåò íà 70—80 %. Ãðîçäè êðóïíûå è î÷åíü êðóïíûå (â ñðåäíåì 500—800 ã). ßãîäû êðóïíûå, îâàëüíûå, òåìíî-ðîçîâûå. Ìÿêîòü ïëîòíàÿ, õðóñòÿùàÿ, ñ õîðîøèì ñî÷åòàíèåì ñàõàðà è êèñëîòû. Óðîæàéíîñòü 100—130 ö/ãà. Òðåáóåò ìîùíûõ ôîðìèðîâîê è äëèííîé îáðåçêè ïëîäîâûõ ëîç. Êóëüòèâèðóåòñÿ â þæíûõ îáëàñòÿõ Óêðàèíû íà ïðèóñàäåáíûõ ó÷àñòêàõ ñ ïðèìåíåíèåì îðîøåíèÿ. Òàìàíü. Êóñòû ñèëüíîðîñëûå. Ãðîçäè êðóïíûå (500— 600 ã), öèëèíäðî-êîíè÷åñêèå èëè âåòâèñòûå, ñðåäíåé ïëîòíîñòè. ßãîäû êðóïíûå (5—6 ã), îêðóãëûå, ðåáðèñòûå, êðàñíî-ñèíèå ñ ëåãêèì ìóñêàòíûì àðîìàòîì. Ñîçðåâàåò ðàíüøå Êàðäèíàëà íà 5—7 äíåé. Óñòîé÷èâîñòü ê ìèëäüþ ïîâûøåííàÿ, ê îèäèóìó è ñåðîé ãíèëè — ñðåäíÿÿ. Èìååò õîðîøèå ïîêàçàòåëè òîâàðíîñòè è òðàíñïîðòàáåëüíîñòè. Òàìáîâñêèé áåëûé. Êóñòû ñèëüíîðîñëûå. Ãðîçäè êðóïíûå, âåòâèñòûå, êîíè÷åñêèå, ñðåäíåé ïëîòíîñòè. ßãîäû êðóïíûå, îêðóãëûå, áåëûå. Ìÿêîòü ìÿñèñòî-ñî÷íàÿ, ñ òîíêèì ìóñêàòíûì àðîìàòîì. Êîæèöà ïðî÷íàÿ. Ñàõàðèñòîñòü 16,3%, êèñëîòíîñòü 5,6 ã/ë. Óðîæàéíîñòü âûñîêàÿ. Âîñïðèèì÷èâ ê îèäèóìó, óñòîé÷èâ ê ñåðîé ãíèëè. Ê ìèëäüþ óñòîé÷èâîñòü ïîâûøåííàÿ. Ìîðîçîñòîéêîñòü -24...-25 °Ñ. Òåìï. Êóñòû ðîñëûå. Ãðîçäè ñðåäíèå, ðûõëûå. ßãîäû ñðåäíèå è êðóïíûå (3—4 ã), îêðóãëûå èëè îâàëüíûå, áåëûå. Ìÿêîòü ìÿñèñòàÿ, ñ ëåãêèì ìóñêàòíûì àðîìàòîì. Óðîæàéíîñòü ñðåäíÿÿ. Ëîçà õîðîøî âûçðåâàåò. Óñòîé÷èâîñòü ê ìèëäüþ è ñåðîé ãíèëè âûñîêàÿ (2 áàëëà). Ìîðîçîñòîéêîñòü ïîâûøåííàÿ. Òîìàéñêèé. Êóñòû ñèëüíîðîñëûå. Ãðîçäè êðóïíûå (300— 500 ã), âåòâèñòûå èëè êîíè÷åñêèå, ñðåäíåé ïëîòíîñòè. ßãîäû êðóïíûå (6 ã), îâàëüíûå, ïî âíåøíåìó âèäó è âêóñó íàïîìèíàþò Êàðäèíàë. Óðîæàéíîñòü âûñîêàÿ (150 ö/ãà). Ñîðò óñòîé÷èâ ê ìèëäüþ è èìååò ïîâûøåííóþ óñòîé÷èâîñòü ê îèäèóìó (3,5 áàëëà). Õðàíèòü óðîæàé íà êóñòàõ íå ðåêîìåíäóåòñÿ, òàê êàê îí áûñòðî ïåðåçðåâàåò è ñèëüíî ïîðàæàåòñÿ ñåðîé ãíèëüþ. Óñòîé÷èâîñòü ê ôèëëîêñåðå âûñîêàÿ. Èìååò õîðîøóþ òîâàðíîñòü è ñðåäíþþ òðàíñïîðòàáåëüíîñòü. Ñîçðåâàåò â ïåðâîé äåêàäå àâãóñòà. Òóð ÷åðíûé. Êóñòû ñèëüíîðîñëûå. Ãðîçäè î÷åíü êðóïíûå (400—700 ã), âåòâèñòûå, ðûõëûå. ßãîäû êðóïíûå (6 ã), îâàëüíûå, ÷åðíûå. Ìÿêîòü ïëîòíàÿ, îòëè÷íîãî âêóñà. Óðîæàé¬íîñòü î÷åíü âûñîêàÿ, òðåáóåòñÿ íîðìèðîâàíèå. Óñòîé÷èâîñòü ê ìèëäüþ, ñåðîé ãíèëè âûñîêàÿ. Óãîëåê. Êóñòû ñðåäíåðîñëûå. Ãðîçäè ñðåäíèå (250—300 ã), öèëèíäðè÷åñêèå, ñðåäíåé ïëîòíîñòè. ßãîäû êðóïíûå (4 ã), îêðóãëûå, ïðîñòîãî âêóñà. Óñòîé÷èâ ê ãðèáêîâûì áîëåçíÿì. Çèìîñòîéêîñòü ïîâûøåííàÿ. Ñîçðåâàåò â êîíöå èþëÿ — íà÷àëå àâãóñòà. Óðîæàéíûé. Êóñòû ñðåäíåé ñèëû ðîñòà. Ãðîçäè êðóïíûå (400 ã), êîíè÷åñêèå, ðûõëûå. ßãîäû êðóïíûå, îáðàòíî-ÿéöåâèäíîé ôîðìû, çåëåíîâàòî-æåëòûå ñ ãóñòûì ïðóèíîì. Êîæèöà ïëîòíàÿ, ïðî÷íàÿ, õðóñòÿùàÿ. Ìÿêîòü ìÿñèñòî-ñî÷íàÿ, âêóñ ïðîñòîé. Ñàõàðèñòîñòü 15—17%, êèñëîòíîñòü 7—9 ã/ë, äåãóñòàöèîííàÿ îöåíêà âèíîãðàäà 8,5 áàëëà. Óðîæàéíîñòü âûñîêàÿ (230—250 ö/ãà). Ïîáåãè âûçðåâàþò õîðîøî. Ñîðò îáëàäàåò ïîâûøåííîé ìîðîçîñòîéêîñòüþ è âûñîêîé óñòîé¬÷èâîñòüþ ê ìèëäüþ, ñåðîé ãíèëè è îèäèóìó. Òîëåðàíòåí ê ôèëëîêñåðå. Îòëè÷àåòñÿ õîðîøåé òðàíñïîðòàáåëüíîñòüþ è ëåæêîñòüþ ïðè çèìíåì õðàíåíèè. Ñîçðåâàåò â íà÷àëå îêòÿáðÿ. Ôàíòàçèÿ. Êóñòû ñðåäíåé è âûøå ñðåäíåé ñèëû ðîñòà. Ãðîçäè êðóïíûå (400 ã), êîíè÷åñêèå, ñðåäíåé ïëîòíîñòè. ßãîäû êðóïíûå (4—5 ã), ÿéöåâèäíûå, ðîçîâûå. Âêóñ ïðîñòîé. Óðîæàéíîñòü 140 ö/ãà. Ïîâûøåííàÿ óñòîé÷èâîñòü ê ìèëäüþ, ñåðîé ãíèëè; ñðåäíÿÿ — ê îèäèóìó. Òîâàðíîñòü è òðàíñïîðòàáåëüíîñòü õîðîøèå. Ôëàìèíãî. Ñîðò ñðåäíåãî èëè ñðåäíåïîçäíåãî ïåðèîäà ñîçðåâàíèÿ. Êóñòû ñðåäíåé ñèëû ðîñòà. Ãðîçäè êðóïíûå (500 ã), êîíè÷åñêèå, ïîëóïëîòíûå. ßãîäû êðóïíûå (6 ã), îêðóãëûå èëè îâàëüíûå, êðàñèâîãî ðîçîâîãî öâåòà. Âêóñ ïðîñòîé, ãàðìîíè÷íûé. Öâåòîê ôóíêöèîíàëüíî-æåíñêèé. Óðîæàéíîñòü âûñîêàÿ (140—160 ö/ãà). Íà 1 ïîáåã ïðèõîäèòñÿ 1,4 ñîöâåòèÿ. Óñòîé÷èâ ê ìèëäüþ, èìååò ïîâûøåííóþ óñòîé÷èâîñòü ê îèäèóìó, ñåðîé ãíèëè ÿãîä, ôèëëîêñåðå. Òðàíñïîðòàáåëüíîñòü õîðîøàÿ. Òîâàðíîñòü — îòëè÷íàÿ. Ôëîðà (Ëîðà). Ðàííèé ñòîëîâûé ñîðò. ßãîäû áîëüøèå, îâàëüíûå, ìîëî÷íî-áåëûå ñ êîðè÷íåâûì çàãàðîì íà ñîëíå÷íîé ñòîðîíå. Ìàññà 7-9 ã. Ìÿêîòü ïëîòíàÿ, âêóñíàÿ. Ãðîçäè øèðîêîêîíå÷íûå, ñðåäíåé ïëîòíîñòè äî 600-800 ã. Òðàíñïîðòàáåëüíûé. Çèìîñòîéêèé. Ôðóìîàñà àëáý. Êóñòû ñðåäíåðîñëûå, íà ïîäâîå ñèëüíî-ðîñëûå. Ãðîçäè êðóïíûå (400 ã), êîíè÷åñêèå, êðûëàòûå, ñðåäíåïëîòíûå. ßãîäû êðóïíûå (28 õ 22 ìì, 6 ã), îêðóãëûå, áåëûå. Ìÿêîòü ìÿñèñòî-ñî÷íàÿ, ñ ìóñêàòíûì àðîìàòîì, îòëè÷íîãî âêóñà. Ñàõàðèñòîñòü 16—17%, êèñëîòíîñòü 7,5 ã/ë. Óñòîé÷èâîñòü ê ìèëäüþ è ñåðîé ãíèëè ïîâûøåííàÿ (3 áàëëà). Õóñàéíå áåëûé. Öåííûé ñðåäíåàçèàòñêèé ñòîëîâûé ñîðò ñðåäíåïîçäíåãî ñðîêà ñîçðåâàíèÿ. Âåãåòàöèîííûé ïåðèîä —155 äíåé. Êóñòû ñèëüíîðîñëûå, îäíîëåòíèå ïîáåãè âûçðåâàþò äîñòàòî÷íî õîðîøî. Ãðîçäè î÷åíü äëèííûå (äî 30 ñì). ßãîäû êðóïíûå, ïðîäîëãîâàòûå (äëèíîé äî 4 ñì), çåëåíîâàòî-áåëûå. Ìÿêîòü ïëîòíàÿ, ñëåãêà õðóñòÿùàÿ, ïðèÿòíîãî âêóñà. Âûñîêèé óðîæàé ïîëó÷àåòñÿ ïðè ìîùíûõ ôîðìèðîâêàõ êóñòîâ ñ çàïàñîì ìíîãîëåòíåé äðåâåñèíû è äëèííîé ïîäðåçêå ëîçû. Íà þãå Óêðàèíû êóëüòèâèðóåòñÿ ëèøü íà ïðèóñàäåáíûõ ó÷àñòêàõ ñ ïðèìåíåíèåì îðîøåíèÿ. ×àðàñìóñêàòíûé. (×àðàñ õ Ìóñêàò ãàìáóðãñêèé). Îáîåïîëûé. Ãðîçäè êðóïíûå (400 ã), öèëèíäðî-êîíè÷åñêèå, ñðåäíåé ïëîòíîñòè. ßãîäû êðóïíûå (4,3 ã), îâàëüíûå, ÷åðíûå, ìóñêàòíûå, î÷åíü âêóñíûå. Ñàõàðèñòîñòü 23—24%, êèñëîòíîñòü 5—7 ã/ë. Ñîçðåâàåò â íà÷àëå ñåíòÿáðÿ. Âåãåòàöèîííûé ïåðèîä 135 äíåé ïðè ñóììå àêòèâíûõ òåìïåðàòóð 2800—3000 °Ñ. Óðîæàéíîñòü âûñîêàÿ — 10—13 êã ñ êóñòà. ×àððåëü. Ìîëäàâñêèé ñîðò. Êóñòû î÷åíü ñèëüíîðîñëûå. Ãðîçäè êðóïíûå (500 ã), ñðåäíåé ïëîòíîñòè èëè ïëîòíûå. ßãîäû êðóïíûå (7 ã), îâàëüíûå, áåëûå ñ ðîçîâèíêîé, êðàñèâûå. Ìÿêîòü ìÿñèñòî-ñî÷íàÿ, âêóñ ïðîñòîé, ïðèÿòíûé. Óðî¬æàéíîñòü âûñîêàÿ, îñîáåííî íà êðóïíûõ ôîðìèðîâêàõ. Ëîçà âûçðåâàåò õîðîøî. Óñòîé÷èâ ê ìèëäüþ, îèäèóìó (2 áàëëà) à òàêæå ê ñåðîé ãíèëè è ôèëëîêñåðå. Ìîðîçîñòîéêîñòü -23... -24 °Ñ. Âûñîêèå ïîêàçàòåëè òîâàðíîñòè, ëåæêîñòè. ×àóø. Ñòîëîâûé ñîðò ðàííåãî ñðîêà ñîçðåâàíèÿ ñ êðóïíûìè ÿéöåâèäíûìè áåëûìè ÿãîäàìè. Âåãåòàöèîííûé ïåðèîä 135—140 äíåé. Êóñò ñèëüíîðîñëûé, ëîçà âûçðåâàåò ïî÷òè ïîëíîñòüþ. Óðîæàéíîñòü 75—80 ö/ãà. Ñîðò èìååò ôóíêöèîíàëüíî-æåíñêèé òèï öâåòêà, ïîýòîìó äëÿ ïîëó÷åíèÿ âûñîêîãî óðîæàÿ òðåáóåò äîïîëíèòåëüíîãî îïûëåíèÿ. Ëó÷øèìè ñîðòàìè-îïûëèòåëÿìè ÿâëÿþòñÿ Ñàïåðàâè, Øàñëà, Êàáàñèÿ. ×åðåøíåâûé. Êóñòû ñðåäíåðîñëûå. Ãðîçäè êðóïíûå (400 ã), êîíè÷åñêèå, ñðåäíåé ïëîòíîñòè. ßãîäû êðóïíûå (22 X 19 ìì, 4__5 ã), îâàëüíûå, ÷åðíûå. Ìÿêîòü ìÿñèñòî-ñî÷íàÿ, ïðîñòîãî âêóñà. Óðîæàéíîñòü âûñîêàÿ. Óñòîé÷èâîñòü ê ìèëäüþ è îèäèóìó 2—3 áàëëà. Ìîðîçîñòîéêîñòü ïîâûøåííàÿ (-23.. .-24 °Ñ). Øàñëà áåëàÿ. Äðåâíèé åãèïåòñêèé ñîðò âèíîãðàäà, êóëüòèâèðóåìûé â Øâåéöàðèè, Ôðàíöèè, Âåíãðèè, Ðóìûíèè, Áîëãàðèè è äðóãèõ ñòðàíàõ. Êîðîíêà ìîëîäîãî ïîáåãà âèííî-êðàñíàÿ, ïîêðûòà ñðàâíèòåëüíî ãóñòûì ïàóòèíèñòûì îïóøåíèåì. Ëèñòüÿ áðîíçîâîé îêðàñêè, ïî÷òè ãîëûå. Îäíîëåòíèé âûçðåâøèé ïîáåã êðàñíîâàòî-êîðè÷íåâûé. Ëèñò ñðåäíåé âåëè÷èíû, îêðóãëûé, 5-ëîïàñòíûé, ñðåäíå- èëè ãëóáîêîðàññå÷åííûé, ñ çàãèáàþùèìèñÿ âíèç êðàÿìè. Íà íèæíåé ïîâåðõíîñòè ëèñòà èìååòñÿ ùåòèíèñòîå îïóøåíèå âäîëü æèëîê. Öâåòîê îáîåïîëûé. Ãðîçäü ñðåäíåé âåëè÷èíû (äëèíîé 14—16, øèðèíîé 8—9 ñì), öèëèíäðî-êîíè÷åñêàÿ èëè êîíè÷åñêàÿ, ñðåäíåé ïëîòíîñòè èëè ïëîòíàÿ. Ñðåäíÿÿ ìàññà ãðîçäè 193 ã. ßãîäà ñðåäíåé âåëè÷èíû (äëèíîé 15—17, øèðèíîé 15— 16 ìì), îêðóãëàÿ, æåëòî-çåëåíàÿ ñ óìåðåííûì âîñêîâûì íàëåòîì, çîëîòèñòûì îòòåíêîì è êîðè÷íåâûìè ïÿòíàìè. Êîæèöà òîíêàÿ, íî ñðàâíèòåëüíî ïðî÷íàÿ. Ìÿêîòü î÷åíü íåæíàÿ, òàþùàÿ. Ñîê áåñöâåòíûé. Âêóñ ïðèÿòíûé, ãàðìîíè÷íûé, áåç àðîìàòà. Ñðåäíÿÿ ìàññà 100 ÿãîä 220 ã. Â ÿãîäå 2—3 íåáîëüøèõ ñåìåíè. Îòíîñèòñÿ ê ñîðòàì ðàííåãî ñðîêà ñîçðåâàíèÿ. Îò íà÷àëà ðàñïóñêàíèÿ ïî÷åê äî ñúåìíîé çðåëîñòè ÿãîä ïðîõîäèò â ñðåäíåì 125 (îò 105 äî 136) äíåé. Øàñëó áåëóþ ïðèíÿòî ñ÷èòàòü îòïðàâíûì (áàçèñíûì) ñîðòîì ïðè ðàñïðåäåëåíèè ñîðòîâ ïî ïåðèîäàì ñîçðåâàíèÿ. Ïðè ýòîì èñõîäÿò èç òîãî, íà ñêîëüêî äíåé òîò èëè èíîé ñîðò âèíîãðàäà ñîçðåâàåò ðàíüøå èëè ïîçäíåå. Ñèëà ðîñòà êóñòîâ ñðåäíÿÿ. Îäíîëåòíèå ïîáåãè âûçðåâàþò õîðîøî — äî 90%. Ñîðò îòëè÷àåòñÿ ñòàáèëüíîé âûñîêîé óðîæàéíîñòüþ. Â ñèëüíîé ñòåïåíè ïîðàæàåòñÿ ïÿòíèñòûì íåêðîçîì è ìèëäüþ. Êàê è äðóãèå ðàéîíèðîâàííûå ñòîëîâûå ñîðòà âèíîãðàäà, âîñïðèèì÷èâ ê ñåðîé ãíèëè, áàêòåðèàëüíîìó ðàêó, ïîâðåæäàåòñÿ ôèëëîêñåðîé è ãðîçäåâîé ëèñòîâåðòêîé. Ìîðîçîñòîéêîñòü ñðåäíÿÿ. Çàñóõîóñòîé÷èâîñòü íåâûñîêàÿ. Íàñàæäåíèÿ ìîæíî çàêëàäûâàòü íà âñåõ ïðèãîäíûõ äëÿ âèíîãðàäà ïî÷âàõ. Ëó÷øèå ðåçóëüòàòû ïîëó÷àþòñÿ ïðè êóëüòóðå ñîðòà íà òåïëûõ ñêëîíàõ ñ ñóãëèíèñòûìè, ñóïåñ÷àíûìè, ðàêóøå÷íî-ïåñ÷àíûìè è ïåñ÷àíûìè ïî÷âàìè. Äëÿ âûðàùèâàíèÿ íàðÿäíîãî, ñ âûñîêèìè âêóñîâûìè êà÷åñòâàìè è ïîâûøåííîé òðàíñïîðòàáåëüíîñòüþ ñòîëîâîãî âèíîãðàäà ïðåäïî÷òåíèå ñëåäóåò îòäàâàòü êîðîòêîé îáðåçêå — íà 5—7 ãëàçêîâ. Ñ óâåëè÷åíèåì âîçðàñòà íàñàæäåíèé ïëîäîâûå ñòðåëêè òàêæå îñòàâëÿþò áîëåå êîðîòêèìè. Øàñëà ðîçîâàÿ è Øàñëà ìóñêàòíàÿ. Ýòî ñàìîñòîÿòåëüíûå ñîðòà, áëèçêèå ïî áèîëîãè÷åñêèì îñîáåííîñòÿì ðàñòåíèé, íî îòëè÷àþùèåñÿ ïî öâåòó è âêóñó ÿãîä. Îñîáåííî ïåðñïåêòèâåí ñîðò Øàñëà ìóñêàòíàÿ, îòëè÷àþùèéñÿ âûñîêèìè âêóñîâûìè êà÷åñòâàìè ÿãîä. Øåâ÷åíêîâñêèé. Êóñòû ðîñëûå. Ãðîçäè êðóïíûå, êîíè÷åñêèå. ßãîäû ñðåäíèå è êðóïíûå (3—7 ã), îâàëüíûå, áåëûå. Ìÿêîòü ìÿñèñòî-ñî÷íàÿ, ïðîñòîãî õîðîøåãî âêóñà. Óðîæàéíîñòü î÷åíü âûñîêàÿ. Ïîáåãè âûçðåâàþò õîðîøî. Óñòîé÷èâîñòü ê ìèëäüþ, îèäèóìó, ñåðîé ãíèëè íà óðîâíå 2,5—3 áàëëà. Ìîðîçîñòîéêîñòü ïîâûøåííàÿ — äî -23 °Ñ. Äîñòîèíñòâî ñîðòà â òîì, ÷òî â äîæäëèâóþ ïîãîäó öâåòåíèå ïðîèñõîäèò áåç ñáðàñûâàíèÿ êîëïà÷êîâ, õîòÿ ÿãîäû â ýòîì ñëó÷àå ìåëü÷å. Òîâàðíîñòü âûñîêàÿ. Ýâðèêà. Êóñòû ñðåäíåé èëè âûøå ñðåäíåé ñèëû ðîñòà. Ãðîçäè êðóïíûå (400 ã), êîíè÷åñêèå, ñðåäíåé ïëîòíîñòè. ßãîäû êðóïíûå (5 ã), ïðîäîëãîâàòûå, áåëûå, ïðîñòîãî âêóñà. Óðî¬æàéíîñòü 150 ö/ãà. Óñòîé÷èâ ê ìèëäüþ. Ê îèäèóìó è ñåðîé ãíèëè óñòîé÷èâîñòü ñðåäíÿÿ. Ïîõîæ íà ñîðò Ëÿíà, íî ÿãîäû è ãðîçäè íåñêîëüêî êðóïíåå. Ýçîï. Êóñòû ñèëüíîðîñëûå. Ãðîçäè êðóïíûå, âåòâèñòûå, êîíè÷åñêèå, ïîëóïëîòíûå. ßãîäû êðóïíûå, îêðóãëî-îâàëüíûå, òåìíî-ôèîëåòîâûå. Ìÿêîòü ìÿñèñòàÿ, áåñöâåòíàÿ, ïðèÿòíîãî âêóñà. Êîæèöà ïðî÷íàÿ, íî ìàëîçàìåòíàÿ ïðè åäå. Óðîæàéíîñòü âûñîêàÿ. Óñòîé÷èâ ê ìèëäüþ, îèäèóìó, ñåðîé ãíèëè ÿãîä. Ìîðîçîñòîéêîñòü ïîâûøåííàÿ (-22...-23 °Ñ). Âûñîêîòðàíñïîðòàáåëüíûé è ëåæêèé ñîðò. Þáèëåé Æóðàâëÿ. Êóñòû ñðåäíåé ñèëû ðîñòà. Ãðîçäè êðóïíûå (450 ã), öèëèíäðî-êîíè÷åñêèå, ðûõëûå. ßãîäû êðóïíûå, îêðóãëûå, òåìíî-ðîçîâûå. Êîæèöà ïëîòíàÿ, õðóñòÿùàÿ. Ìÿêîòü ìÿñèñòî-ñî÷íàÿ. Âêóñ ãàðìîíè÷íûé. Ñàõàðèñòîñòü 18 19%, êèñëîòíîñòü 8—9 ã/ë. Äåãóñòàöèîííàÿ îöåíêà 8,1— 8,8 áàëëà. Óðîæàéíîñòü 140—160 ö/ãà. Ïîáåãè âûçðåâàþò õîðîøî. Ñîðò îòëè÷àåòñÿ âûñîêîé ìîðîçîóñòîé÷èâîñòüþ (äî -27 °Ñ), îäíàêî ïðè ïåðåãðóçêå êóñòîâ óðîæàåì è äëèòåëüíîì âûäåðæèâàíèè ãðîçäåé äî çàìîðîçêîâ çèìîñòîéêîñòü ñèëüíî ñíèæàåòñÿ. Óñòîé÷èâîñòü ê ìèëäüþ è ñåðîé ãíèëè âûñîêàÿ (2 áàëëà), ê ôèëëîêñåðå — ïîâûøåííàÿ (3 áàëëà), òðàíñïîðòàáåëüíîñòü âûñîêàÿ. Õîðîøî õðàíèòñÿ â òå÷åíèå 3—4 ìåñÿöåâ. Ïðîäîëæèòåëüíîñòü ïðîäóêöèîííîãî ïåðèîäà 165 äíåé. Ñîçðåâàåò â êîíöå ñåíòÿáðÿ — íà÷àëå îêòÿáðÿ. Þáèïåé-70. Êóñòû ñèëüíîðîñëûå. Ãðîçäè êðóïíûå (400— 500 ã). ßãîäû îâàëüíûå, áåëûå, ìàññîé 5—6 ã. Êîæèöà ïëîòíàÿ, õðóñòÿùàÿ. Ìÿêîòü ìÿñèñòî-ñî÷íàÿ, âêóñ ïðèÿòíûé, ñ õîðîøèì ìóñêàòíûì àðîìàòîì. Ñàõàðèñòîñòü 17—18%, êèñëîòíîñòü 7 ã. Óðîæàéíîñòü 160 ö/ãà. Óñòîé÷èâ ê ìèëäüþ, îèäèóìó. Ìîðîçîñòîéêîñòü äî -22 °Ñ. Þæíûé. Êóñòû ñèëüíîðîñëûå. Ãðîçäè êðóïíûå (350 ã), êîíè÷åñêèå èëè âåòâèñòûå, ñðåäíåé ïëîòíîñòè. ßãîäû êðóïíûå (4—5 ã), ñèíå-êðàñíûå. Êîæèöà ïðî÷íàÿ. Âêóñ ïðîñòîé. Ñîðò óðîæàéíûé. Èìååò âûñîêóþ óñòîé÷èâîñòü ê ìèëäüþ, ïîâûøåííóþ — ê îèäèóìó, ñåðîé ãíèëè è ôèëëîêñåðå. Çèìîñòîéêîñòü ñðåäíÿÿ. Òðàíñïîðòàáåëüíîñòü õîðîøàÿ. Þðèí. Êóñòû ñðåäíåé èëè âûøå ñðåäíåé ñèëû ðîñòà. Ãðîçäè êðóïíûå (500 ã), øèðîêîêîíè÷åñêèå, ñðåäíåïëîòíûå èëè ïëîòíûå. ßãîäû êðóïíûå (5—6 ã), îâàëüíûå, ðîçîâûå. Ìÿêîòü ìÿñèñòàÿ, âêóñ ïðîñòîé, ïðèÿòíûé. Ñàõàðèñòîñòü 16— 18 %, êèñëîòíîñòü 7 ã/ë. Äåãóñòàöèîííàÿ îöåíêà ñâåæåãî âèíîãðàäà 8,2 áàëëà. Óðîæàéíîñòü âûñîêàÿ (150—160 ö/ãà). Ïîáåãè âûçðåâàþò õîðîøî. Ñîðò óñòîé÷èâ ê ìèëäüþ, èìååò ïîâûøåííóþ óñòîé÷èâîñòü ê ôèëëîêñåðå è ñðåäíþþ óñòîé÷èâîñòü ê îèäèóìó, ñåðîé ãíèëè. Òðàíñïîðòàáåëüíîñòü è òîâàðíîñòü õîðîøèå. Ìîðîçîñòîéêîñòü ïîâûøåííàÿ. ßëîâåíñêèé óñòîé÷èâûé. Êóñòû ñèëüíîðîñëûå. Ãðîçäè êðóïíûå (400—500 ã), êîíè÷åñêèå, ðûõëûå. ßãîäû êðóïíûå (7—8 ã), îâàëüíûå, çåëåíîâàòî-æåëòûå ñ ïðóèíîì. Êîæèöà ïëîòíàÿ. Ìÿêîòü ìÿñèñòî-ñî÷íàÿ, âêóñ ïðîñòîé. Ñàõàðèñòîñòü 16—18%, êèñëîòíîñòü 7—8 ã/ë. Äåãóñòàöèîííàÿ îöåíêà 8,2 áàëëà. Óðîæàéíîñòü âûñîêàÿ. Ïîáåãè âûçðåâàþò õîðîøî. Óñòîé÷èâîñòü ê ìèëäüþ, îèäèóìó è ñåðîé ãíèëè âûñîêàÿ (2 áàëëà). Ìîðîçîñòîéêîñòü ïîâûøåííàÿ, äî _25 °Ñ. Ôèëëîêñåðîóñòîé÷èâîñòü 3 áàëëà. Ñîðò òðàíñïîðòàáåëüíûé, õîðîøî õðàíèòñÿ â çèìíåå âðåìÿ.